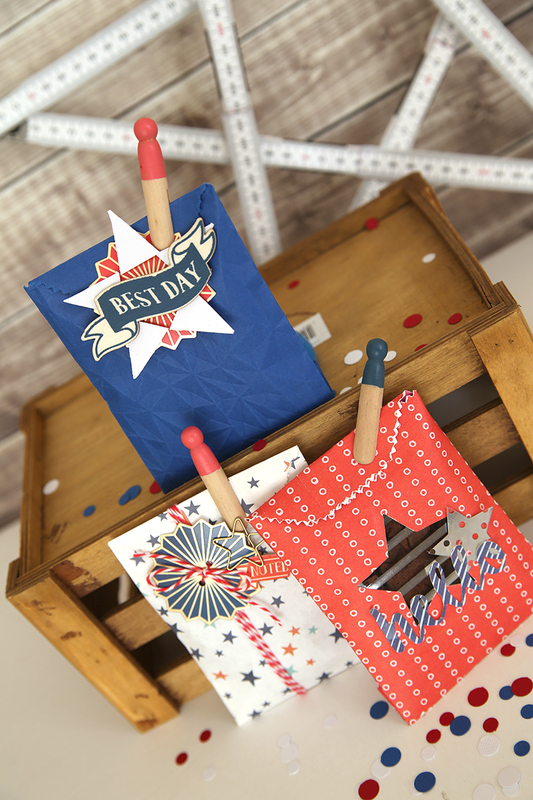 Hello everyone, Wendy here today to share a patriotic banner I created using the Alphabet Punch Board and the Banner Punch Board. I began punching out my letters using the alphabet punch board from the Kraft and Gold 3×5 pads. 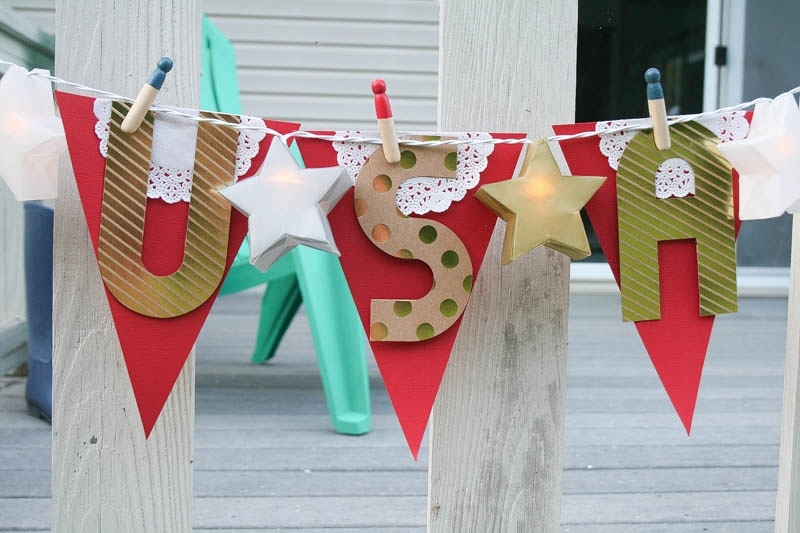 To make the letters stand out and to add in some red, white, and blue, I used the DIY cardstock to punch banner pieces. A simple doily on each of the banners added some vintage feel to match the Goodie Bag clothespins that I used to attach everything. 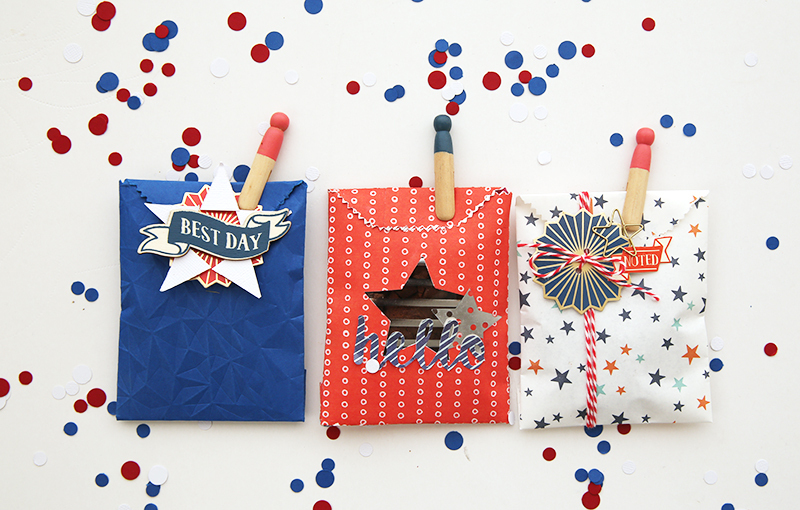 The gold Pull Tabs add the perfect little sparkle to any banner, even though they were made for something else. 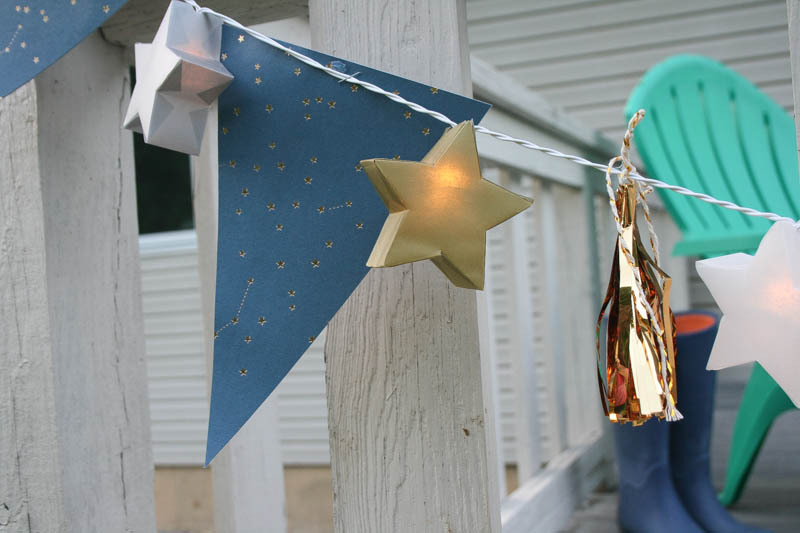 To hang my banner pieces I chose to use the DIY light strand with the metallic stars. 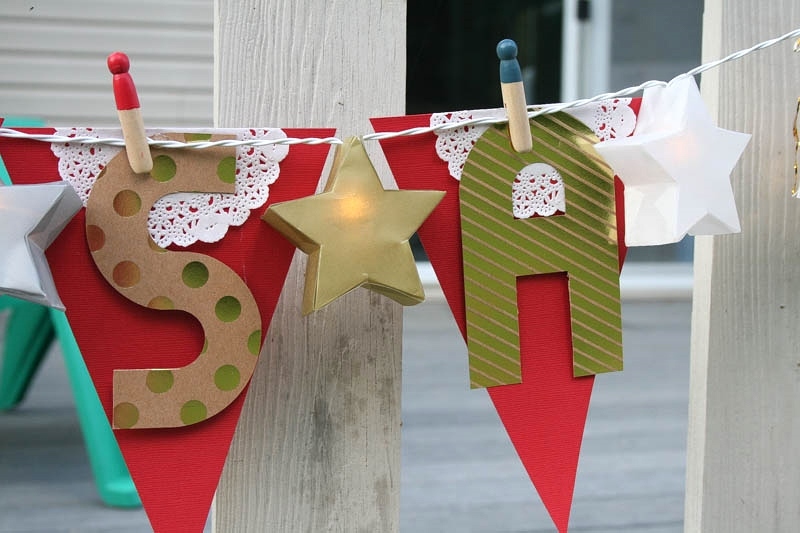 I loved the sparkle that my lit stars added to my banner allowing my banner to shine whether day or night! I love how the different collections mix and match so well allowing many different looks to be achieved! Happy Birthday America! Hello and welcome to the We R Memory Keepers’ blog! 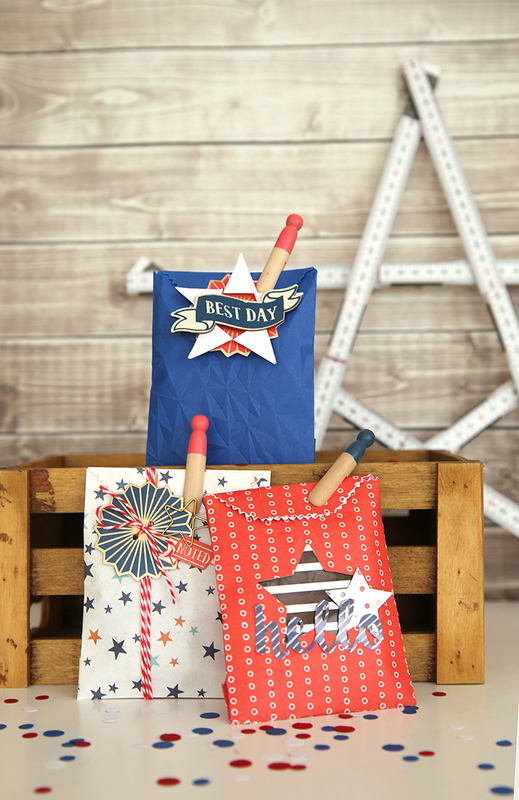 I am Eva Pizarro and today I want to show you how to make some cute Patriotic Treat Bags using the Goodie Bag Guide. 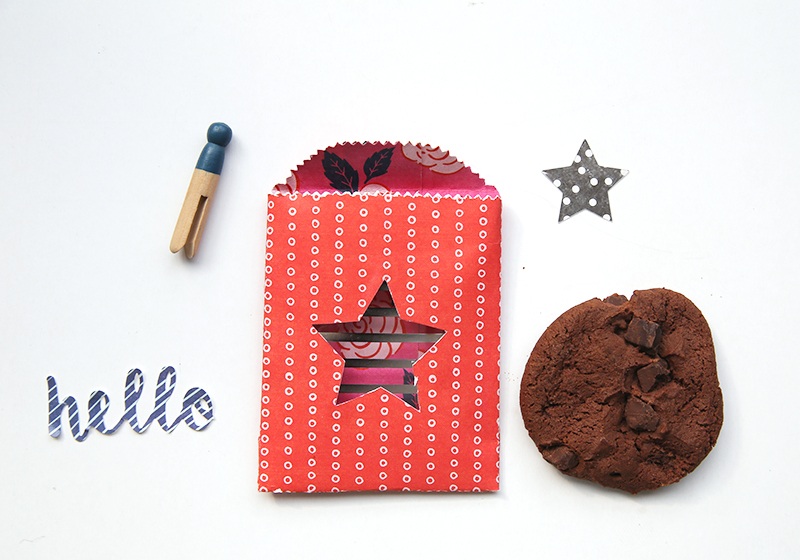 The Oh Goodie Collection has all you need to make easy and cute treat bags, from glassine paper to embellishments and even seals! 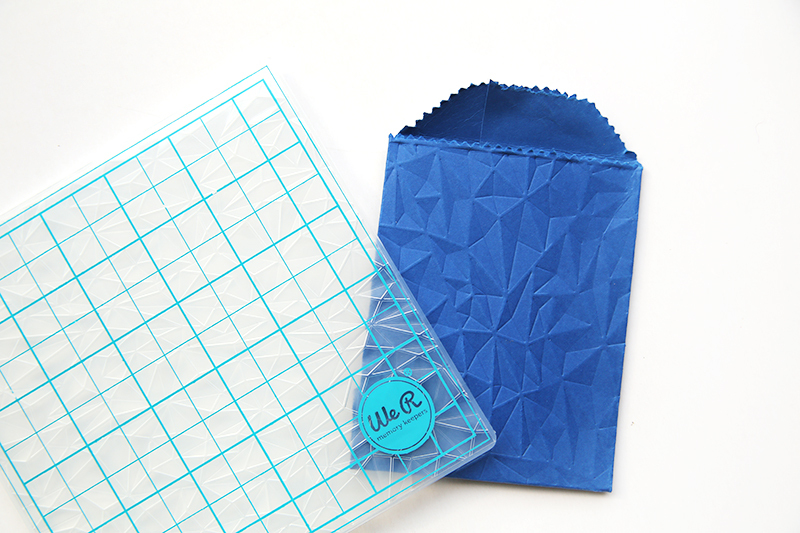 Plus The Goodie Bag Guide can be used with other types of paper. 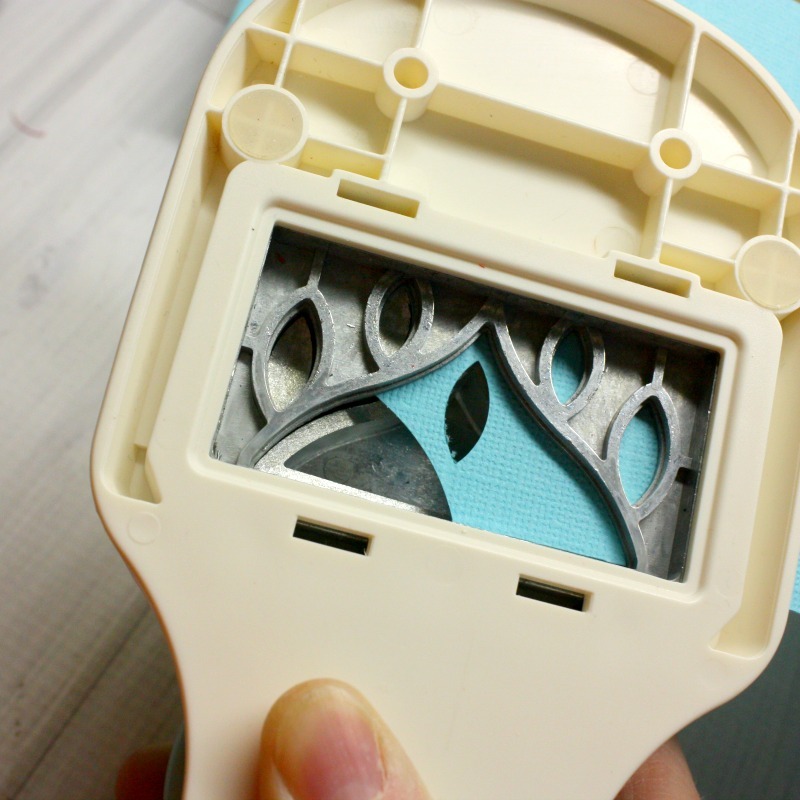 You can see a tutorial on how to use this tool on this We R YouTube video by Aly. 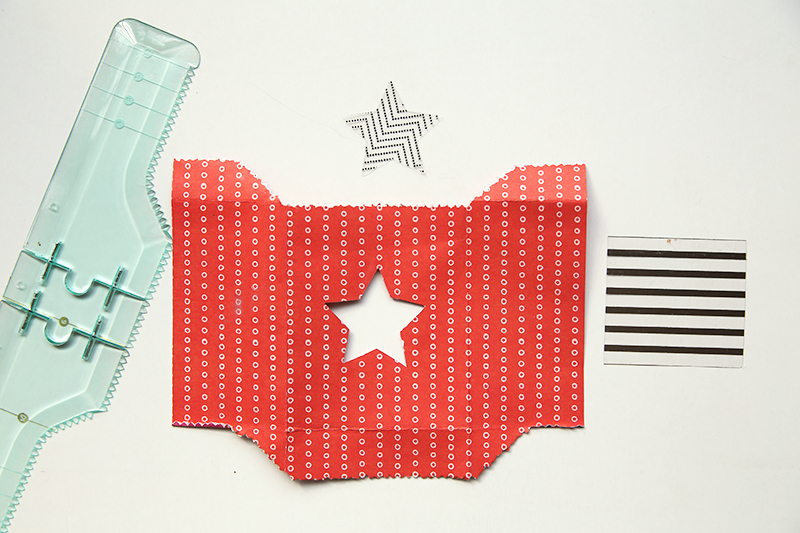 The tool cuts patterned paper really easy, the possibilities are endless! 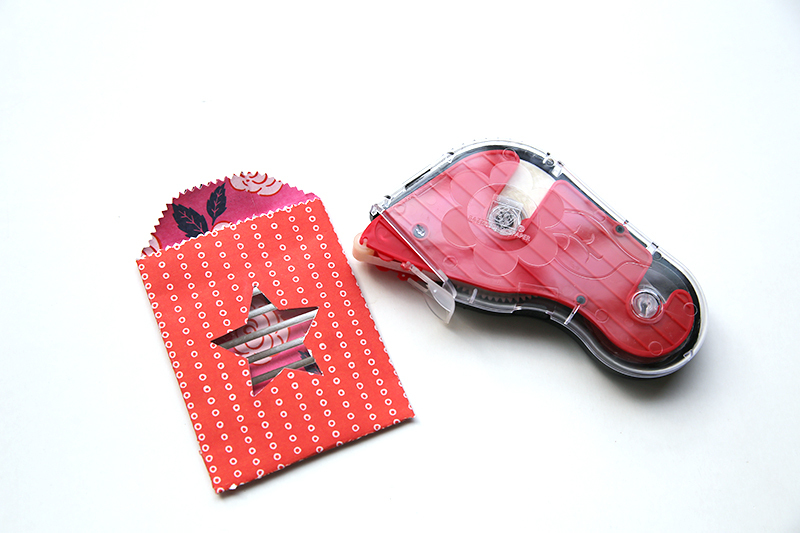 Next, I glued my treat bag with a strong adhesive like this glue gun from Bazzill. I also added a piece of Clearly Posh acetate to cover my star window. 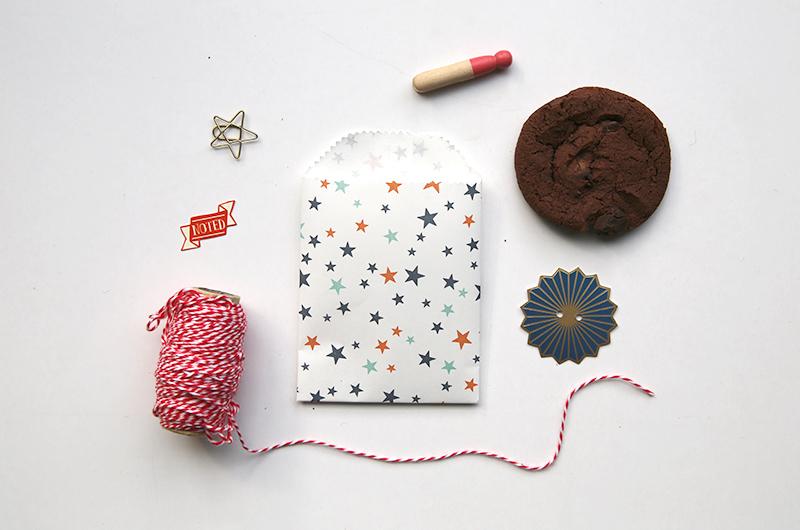 To embellish my treat bag I used a sticker from the Flower Girl collection, a star from the Ephemera Pack of the Clearly Posh Collection, a vintage clothespin, and of course my favorite–a chocolate chip cookie! I assembled everything and this is how it turned out! 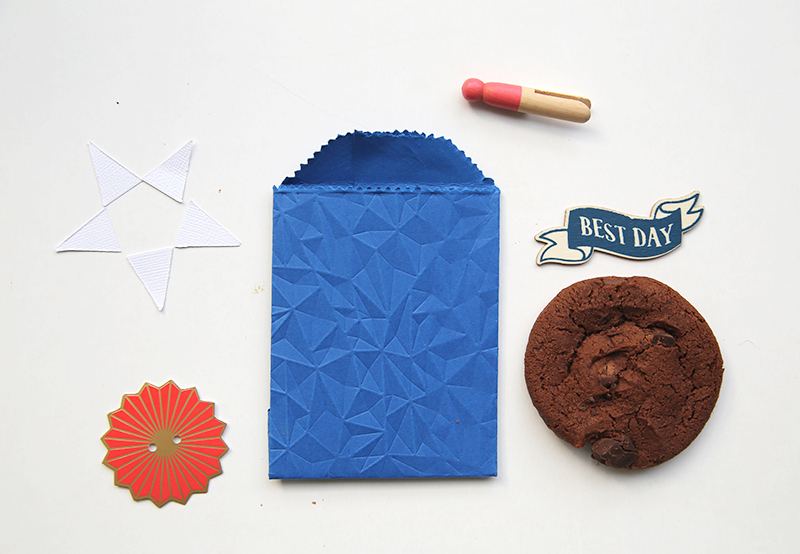 For the next treat bag I used the Oh Goodie paper, the stars pattern was perfect for my theme and I love that my treat bag is grease proof, so no food stains! To decorate I used a die cut from the Flower Girl collection; a vintage clothespin, starburst tag , and star clip from the Oh Goodie Collection; and some baker’s twine. For my last treat bag I ran some cardstock through my Evolution Advanced using the Gemstone Next Level Embossing Folder to add some extra texture to the bag. And I also made 5 mini banners with my Banner Punch Board. I used them to create a star by attaching them on top of a starburst tag. 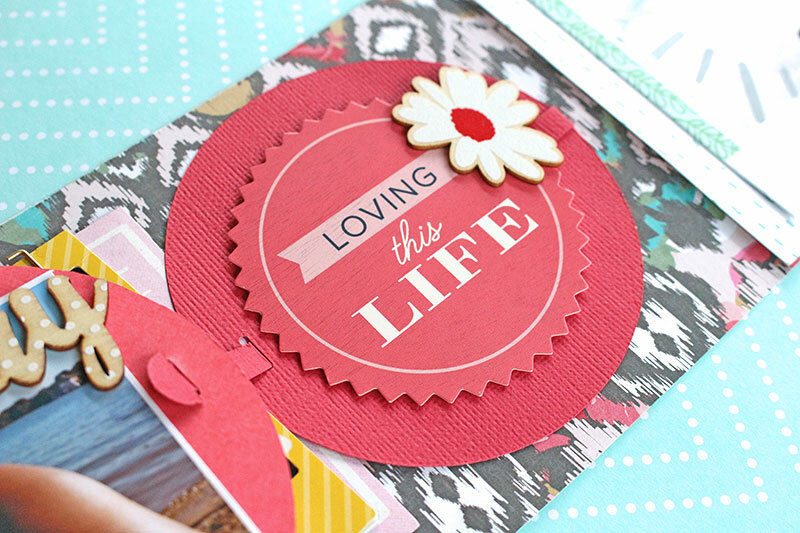 I added a few more embellishments like a wood veneer from the Flower Girl collection and a vintage clothespin. Add your triangles to the tag using some foam dots and finally layer the wood veneer on top. My treat bags are ready and they are so cute! I think all my friends will want one now! 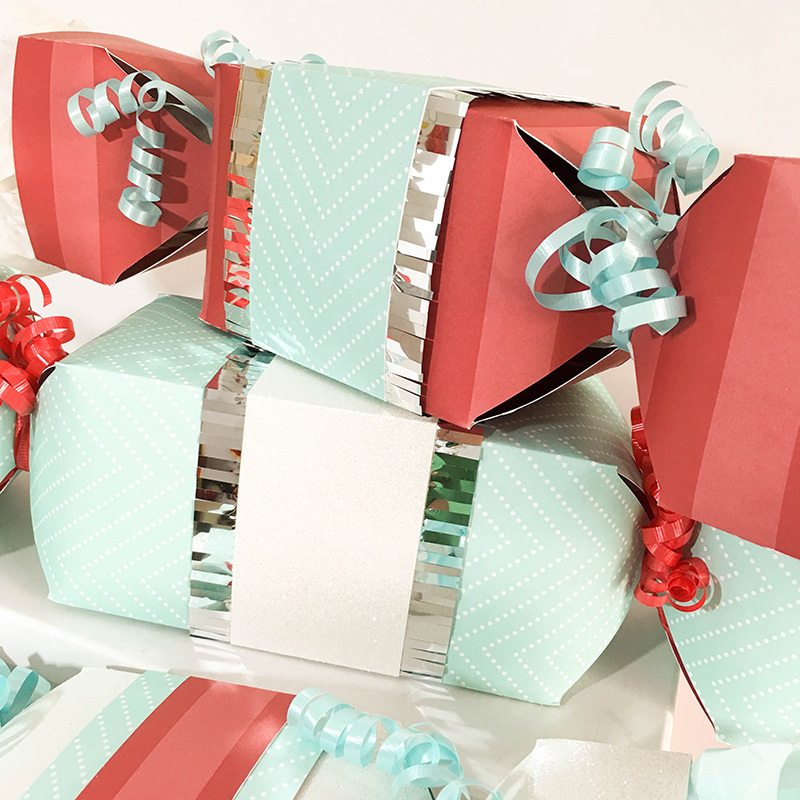 Do you make treat bags for your friends and family? 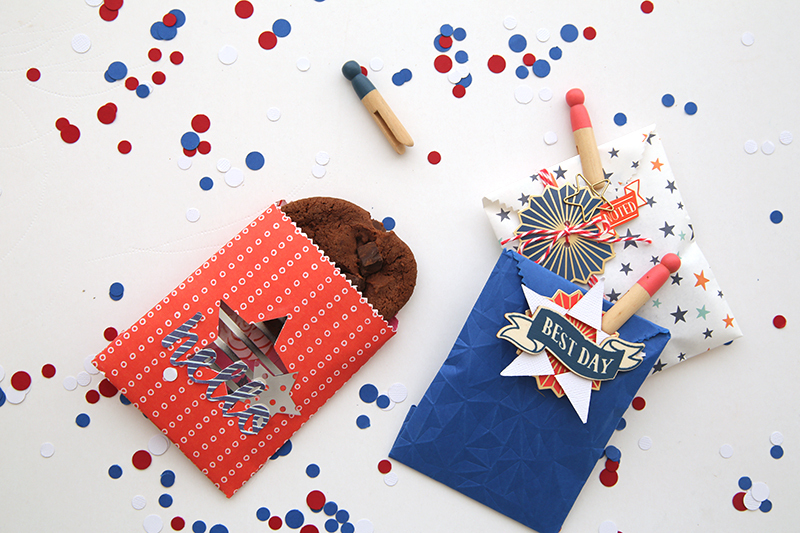 Independence Day is my favorite holiday and I’ve invited friends and family over to celebrate. 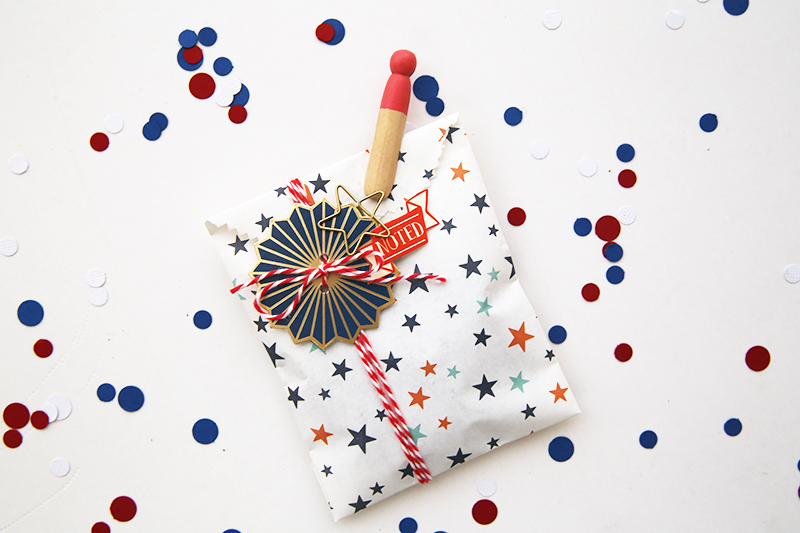 Knowing that my guests will take up more parking on the street than we normally do, I created these fireworks-esque gift boxes filled with treats to give to my neighbors. 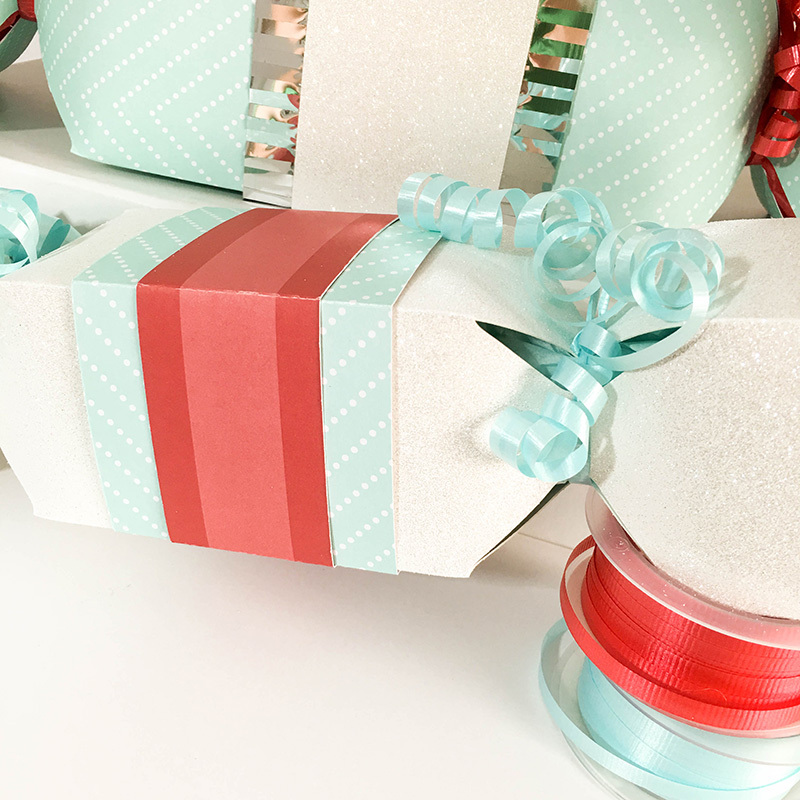 If you haven’t seen the tutorial for using the candy box templates with the Template Studio, it’s a must-see. You can watch it on our YouTube channel HERE. I watched it just once through and was able to make my boxes in no time without any trouble. It never ceases to amaze me just how innovative We R Memory Keepers is! 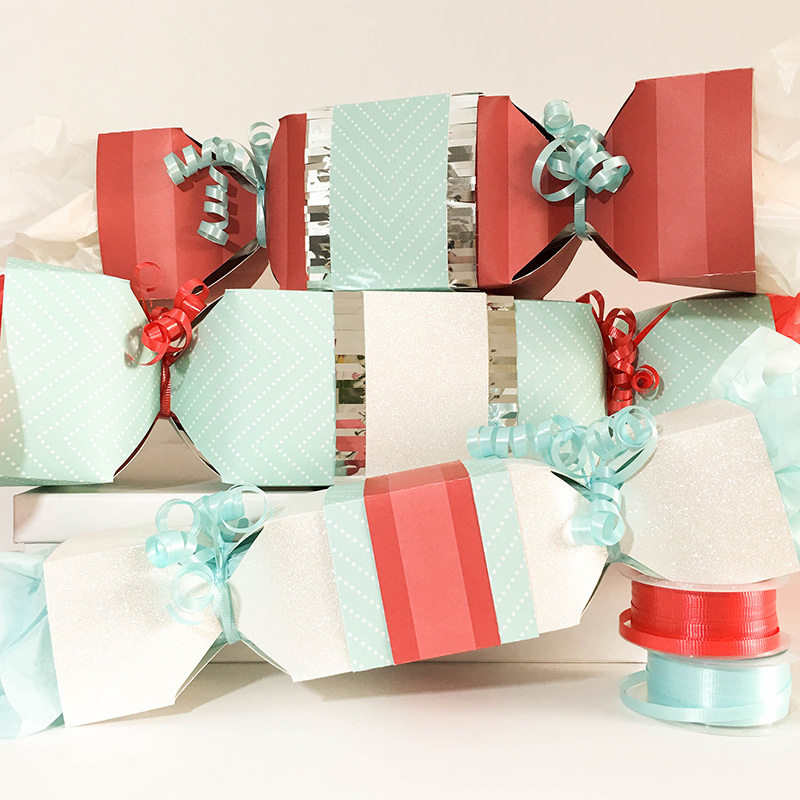 To make my candy boxes extra festive, I stuffed the ends with tissue paper before securing them closed with curling ribbon. I think they look “explosive” this way! 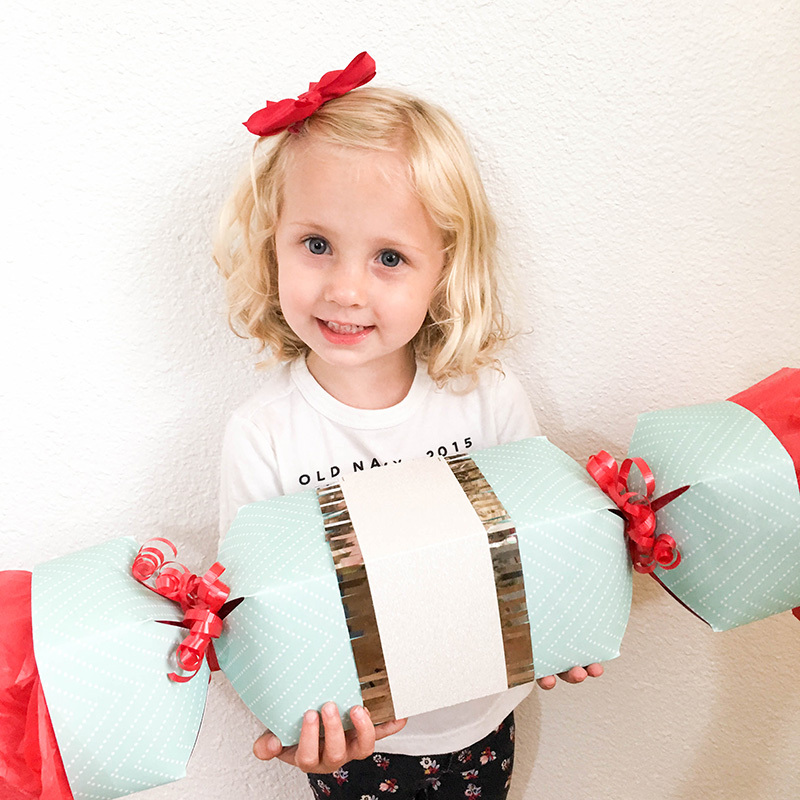 To further dress up the candy boxes, I made wraps from the left over poster board scraps. When making score lines for the wraps, I added 1/8th of an inch to the measurement given for the score marks on the boxes. That little bit of wiggle room makes for a perfect fit. 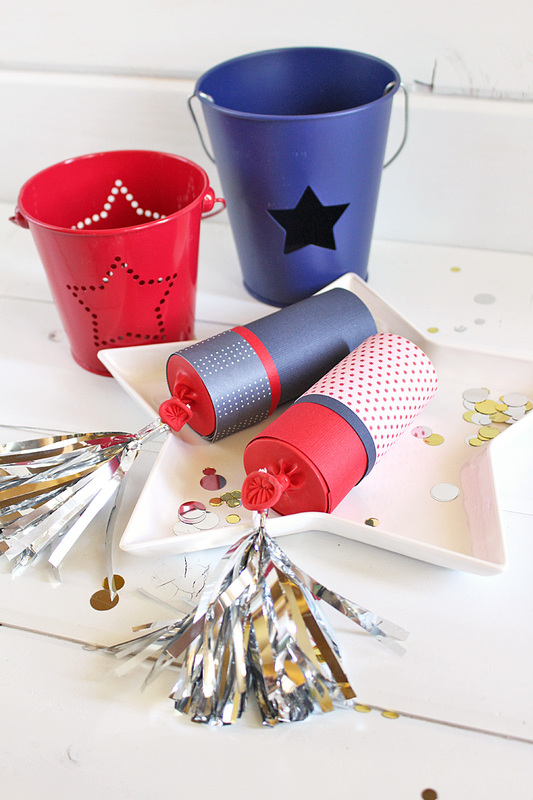 For an added patriotic punch, I used DIY Party Fringe Tape in silver on two of the wraps. I love the shine and sparkle! As you can see, these boxes hold plenty of treats – hopefully enough that the neighbors don’t mind tight parking on July 4th. 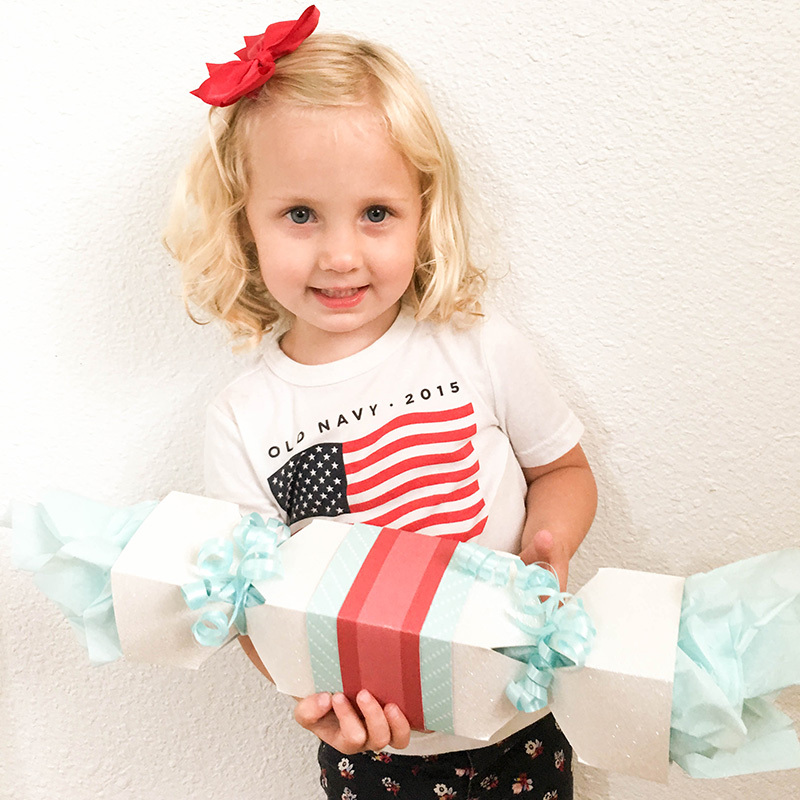 If you’re looking for a great packaging idea for some red, white and blue treats, these candy boxes can’t be beat! Enjoy creating! Happy Summer! Welcome to Red, White, and Blue Week! 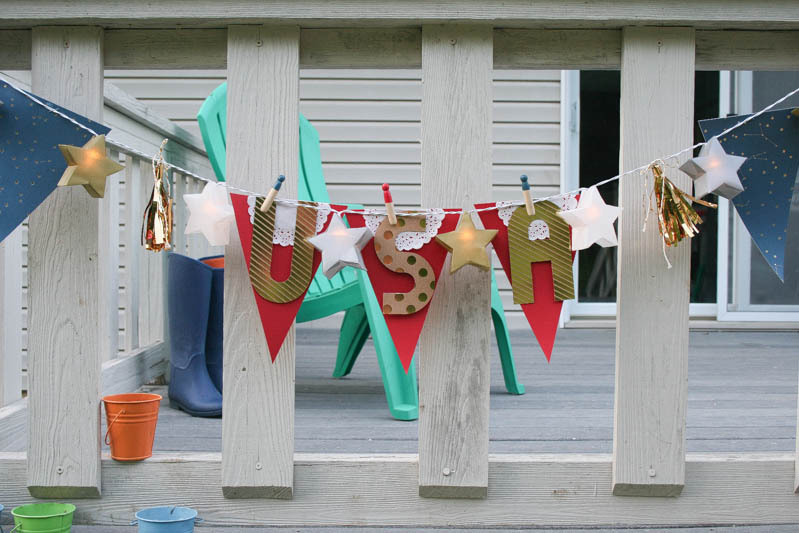 This week we’re celebrating all things summer and patriotic, and we’re excited about the projects our team has put together for you. 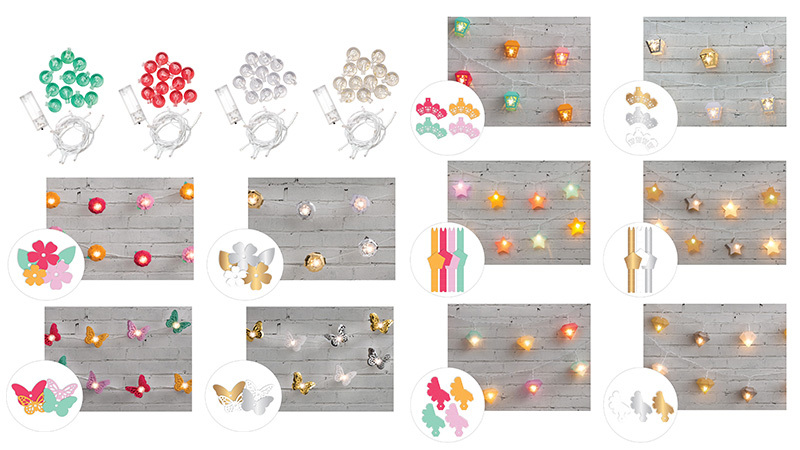 As part of our celebration, we’re also giving away our DIY Party Light Strand collection because, well, summer celebrations are so much more fun with lights! 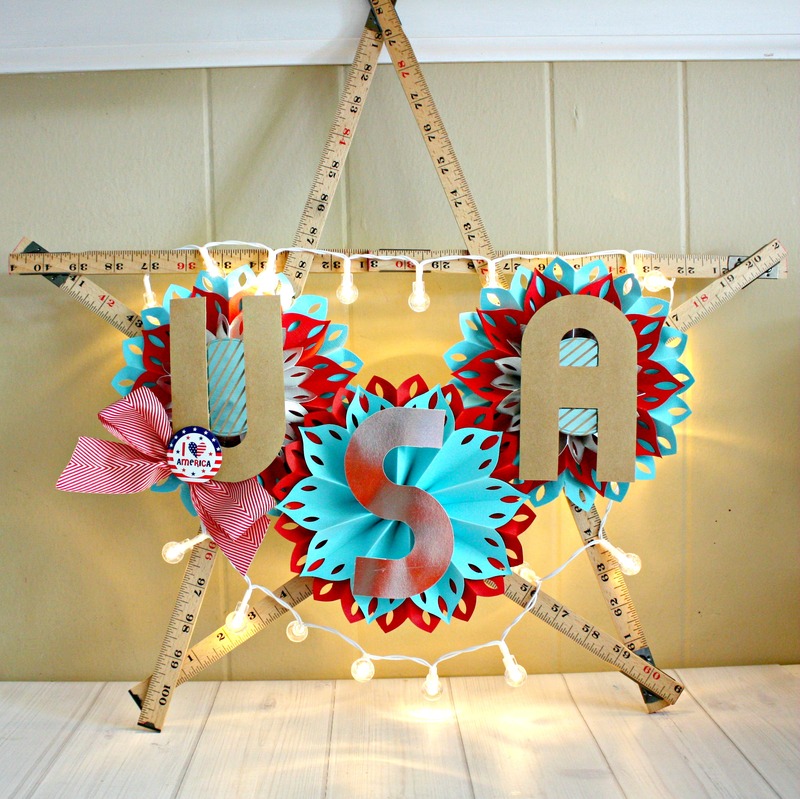 First off is a project from Shellye, and then scroll down to enter our Light Strand Giveaway! Hello! Shellye here to share a fun patriotic home décor project featuring handmade rosettes using the DIY Party Fringe & Score Board, as well as other tools and products! I started by preparing the base (to add the rosettes to) with the “Natural 12” Folded Ruler.” I shaped the ruler into a star shape: each line is two sections of the ruler, for a total of five sections. The overall shape measures 22”X22”. Now for the three rosettes: I’ve used the DIY Party 12X12 Cardstock Pad and the colors of red, turquoise and metallic silver. 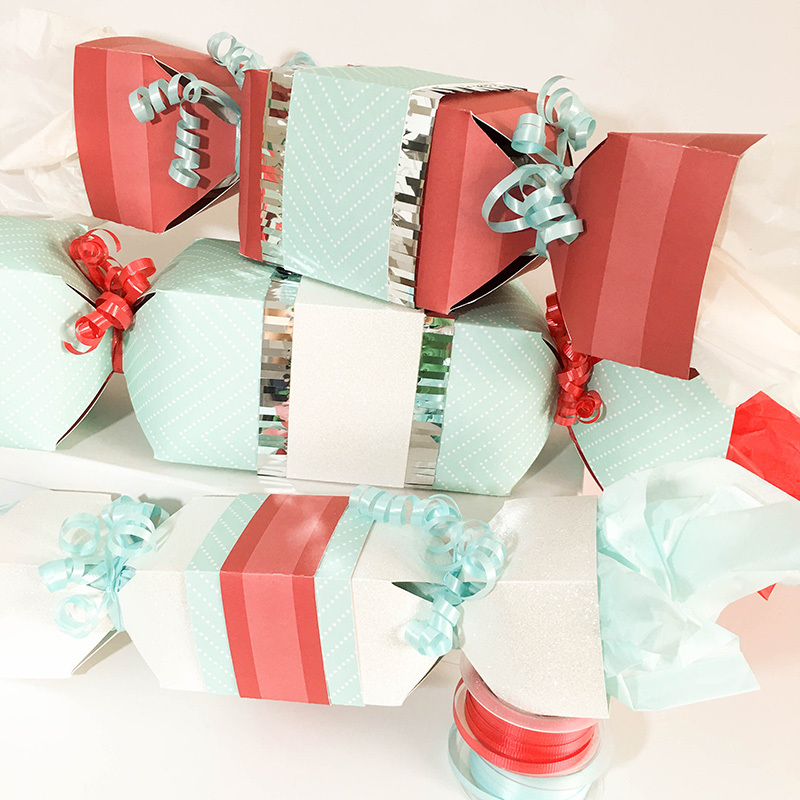 For the two outer rosettes: the turquoise cardstock was cut into 4”wide strips, the red cardstock cut into 3” strips and the metallic silver cut into 2” strips. Next, the DIY Party Fringe & Score Board was used to score the paper at every 1” interval. 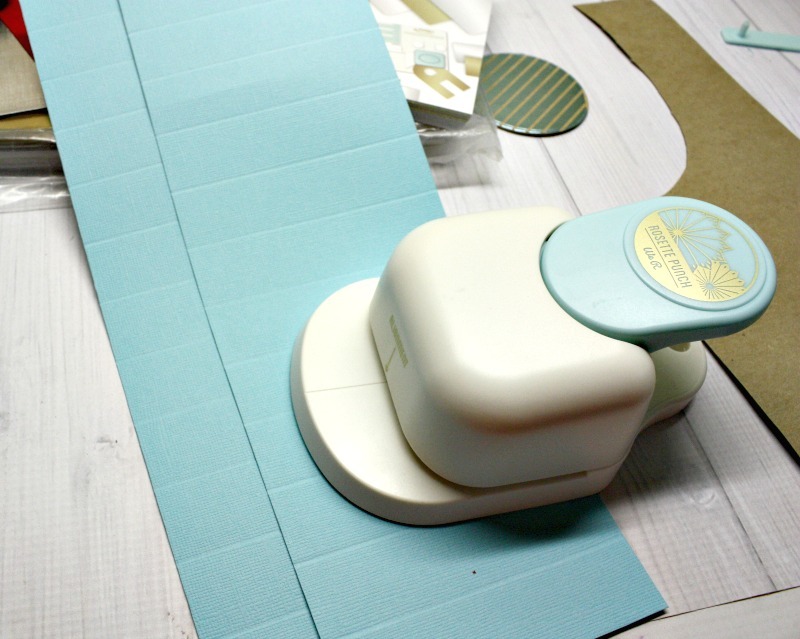 Before accordion folding the paper, I punched each end of the paper with the DIY Party Rosette Paper Punch. 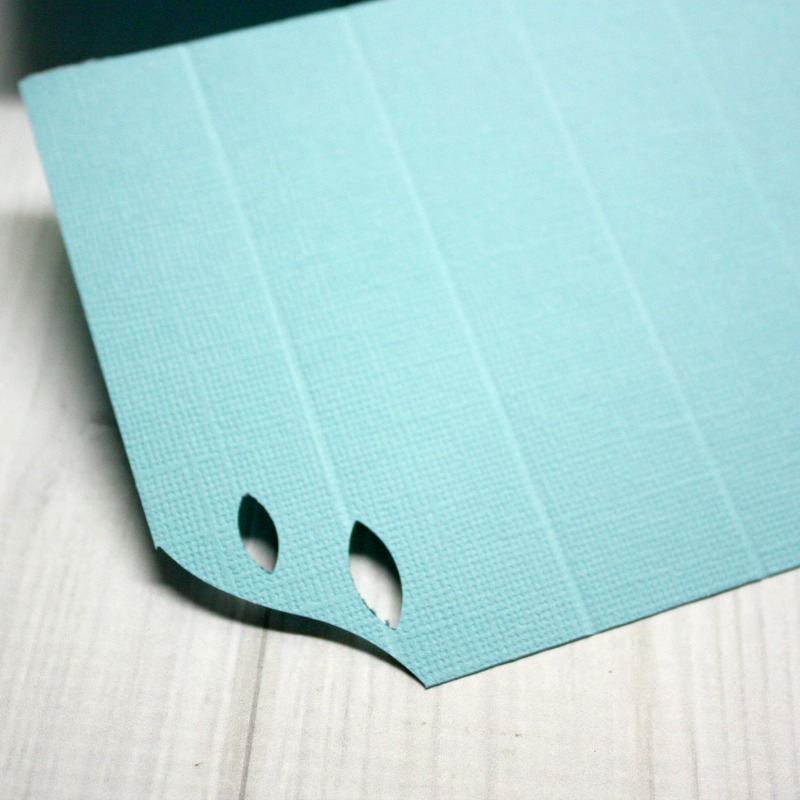 The turquoise paper was punched at every 1” mark, which created a more simple edging. The red paper was punched at every-other 1” mark, creating a more decorative edge. It’s fun to mix and match the designs! The three colors of rosettes were assembled and then stacked together and glued in place. 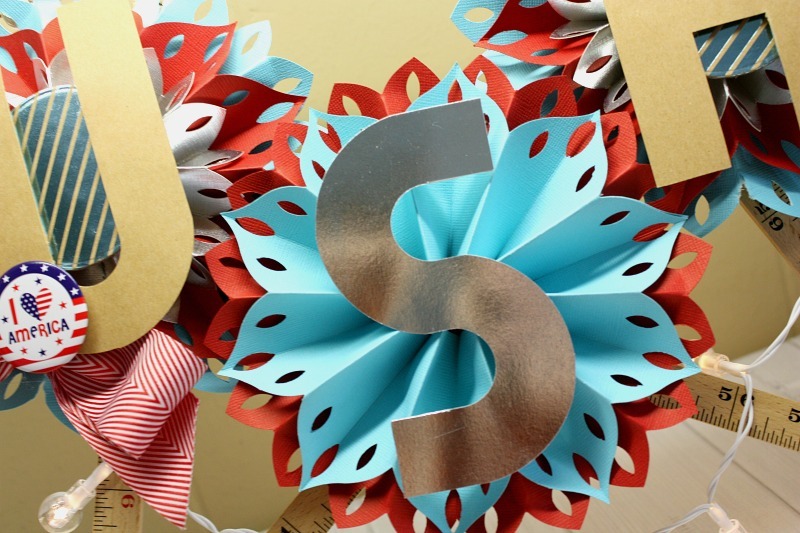 For the center rosette, I used only the red and turquoise papers and then the metallic silver for the letter “S”. 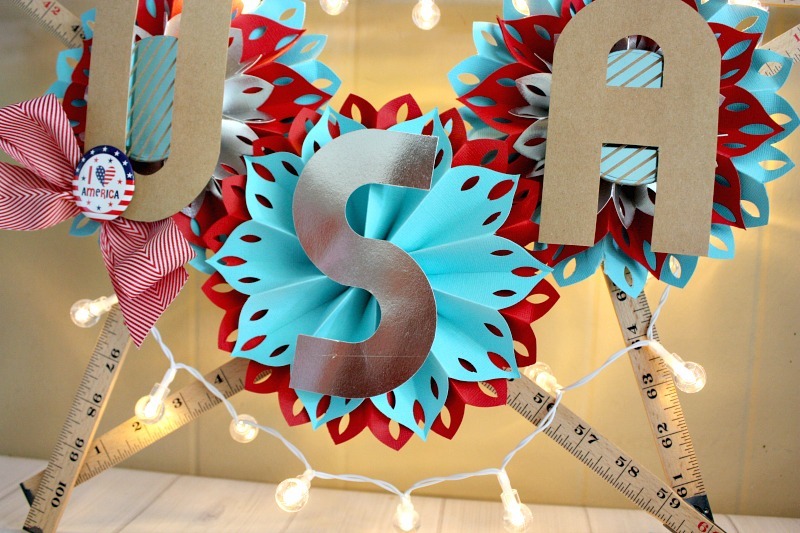 The Alphabet Punch Board and DIY Party Kraft 3X4 Paper Pad were used to create the letters “U” and “A”. Again, I used some of the leftover metallic silver to create the letter “S”. 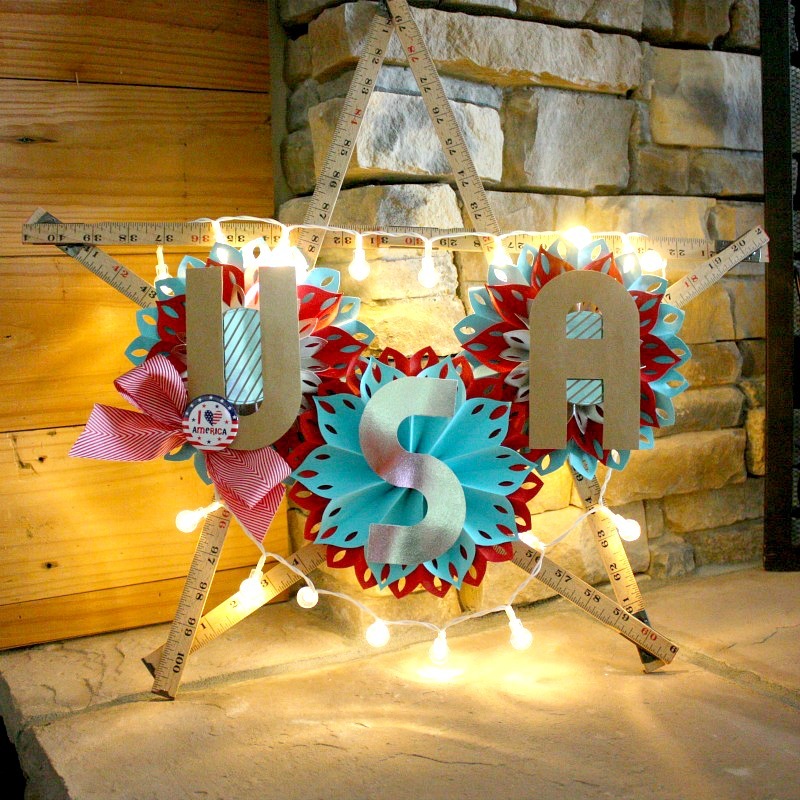 White mini lights from the Ruler Studio Collection were added around the star frame. The piece can stand by a fireplace, on a shelf or can even be hung from a door. 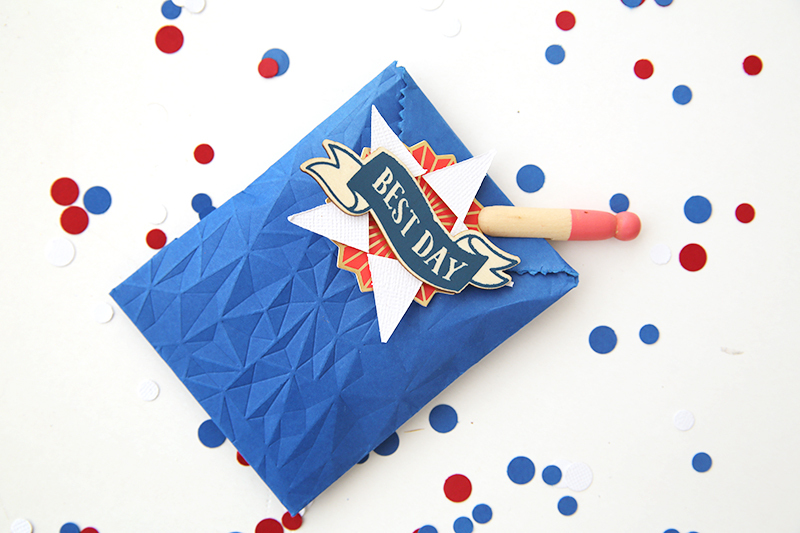 Use string to tie the rosettes to the ruler and then change them out with other colors throughout the year! 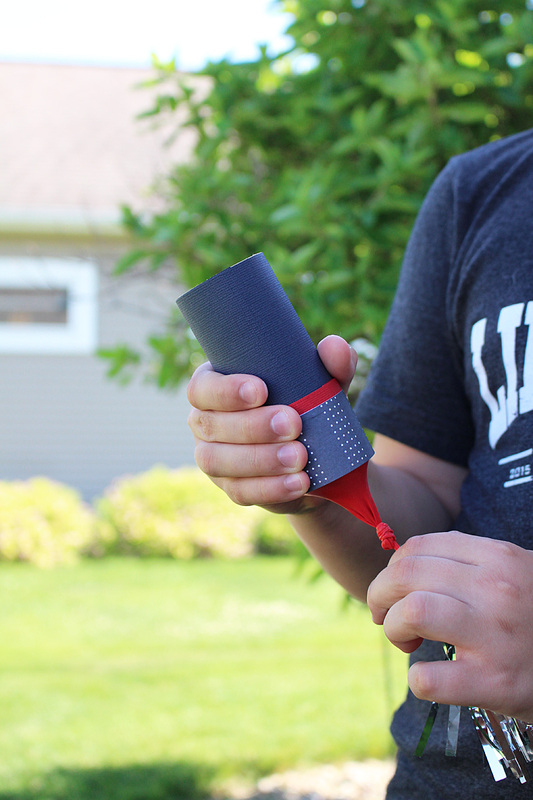 We’re giving away our Light Strand collection to one lucky random winner, and if you’d like to enter for a chance to win please leave a comment below telling me how you would use our Light Strand collection this summer. Comments will remain open until Thursday night at midnight, and our random winner will be announced on Friday, July 1st. Good luck, and remember to check back to see if you won! Hello everyone! 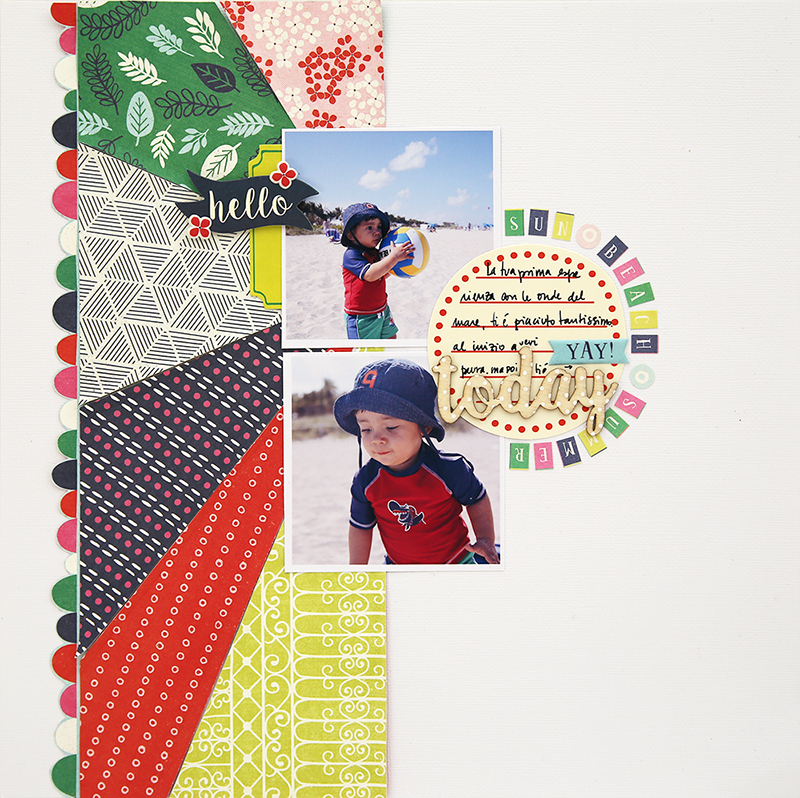 I am Eva Pizarro and today I want to share a quick and easy summer layout using the lovely Flower Girl Collection. 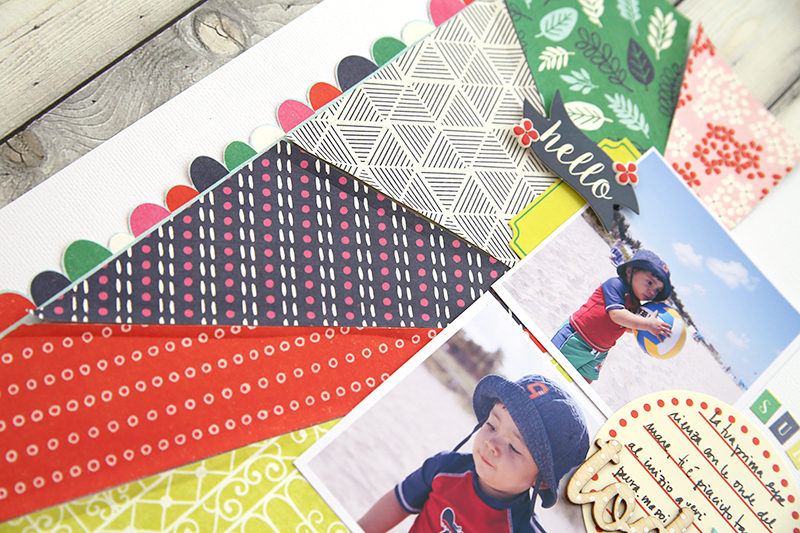 I love the bright colors of this collection and I think it is perfect for summer photos! To make this layout I started with the sunburst on the left. It is very easy to make, just draw your shapes on a scrap piece of paper, cut the pieces out and use them as a template to cut your patterned paper. I added two pictures and some embellishments clusters on the left of my photo. I used some die cuts from the Ephemera pack and Puffy Stickers. I also included a journaling spot between my photos and used a wood veneer as my title. 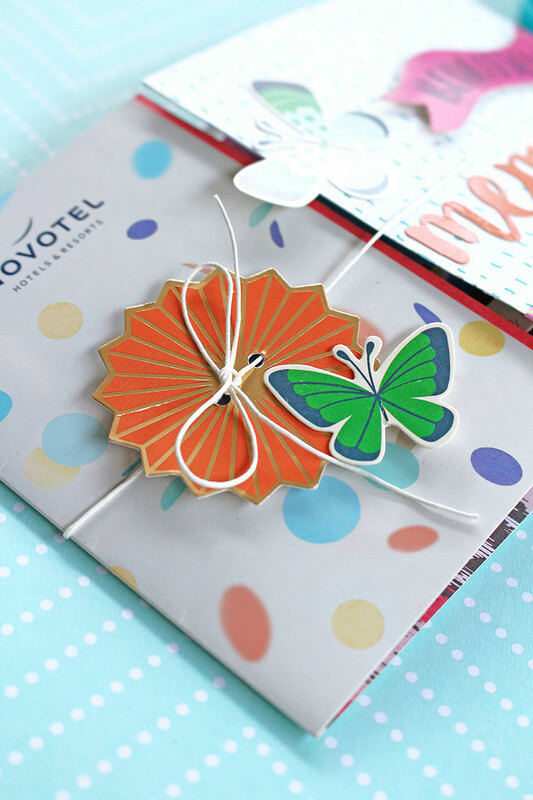 I love these wood shapes, they have the cutest printed designs! 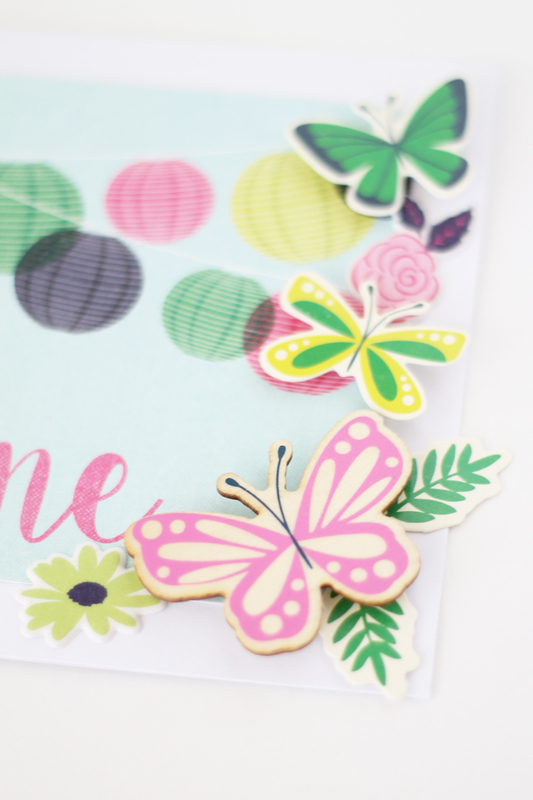 To add a little more color to my layout I added a few summer words to the side of my journaling spot, I used the tiny alphas included on the sticker sheets, I love that I can include some tiny words with perfectly matched colors! I included a border on the left side of my sunburst cut from patterned paper and as a final touch I bent my sunburst borders a little bit to give more dimension. And that’s it! 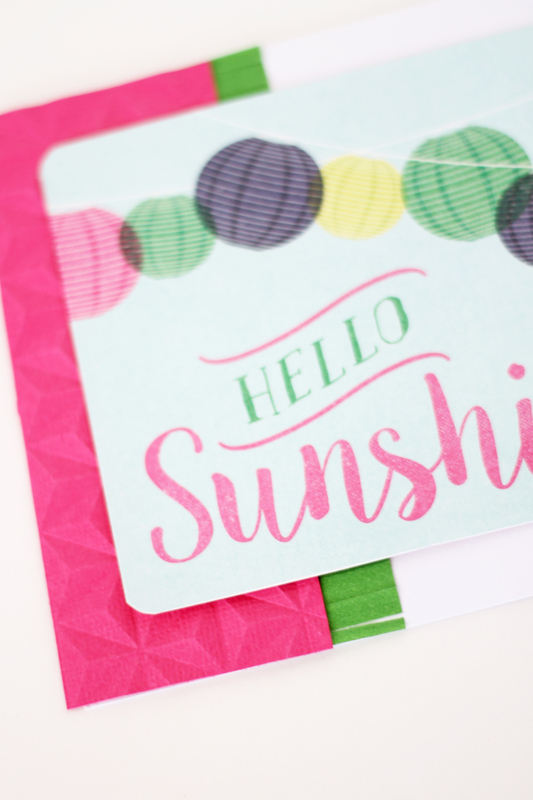 I love how this page turned out, the colors really pop against my white cardstock and the sunburst always reminds me of summer, how about you? What makes you think of summer? Angle Corner Chomper + Case Winner! I would use it on tags, cards, and anything else that could do with a chomp !! Congratulations Debbie! 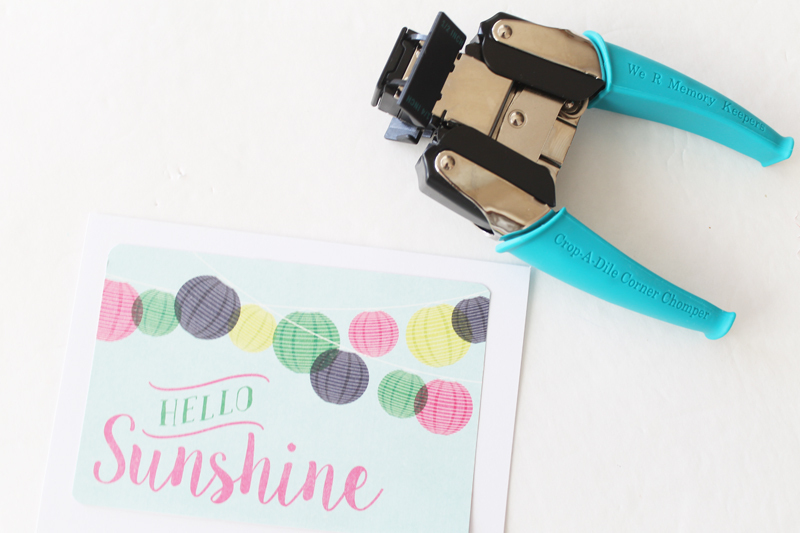 Please send an email to wrsocial@americancrafts.com with “Angle Corner Chomper + Case Winner” in the subject line. Include your full name and shipping address and we’ll get your prize to you asap! Enjoy! Hello We R fans! 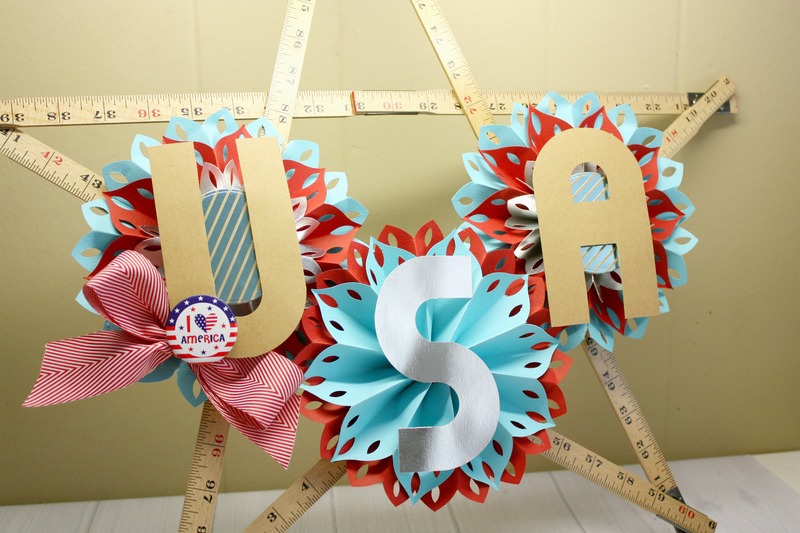 Kimberly here to share a fun summer craft project with you today, a project for you and your kiddos! Summertime is about celebrations and fun. 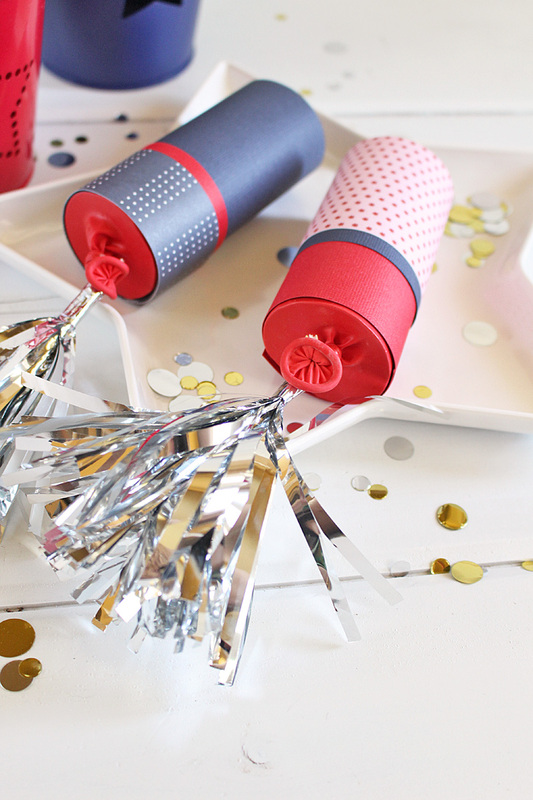 These easy-to-make confetti poppers are sure to be a hit! 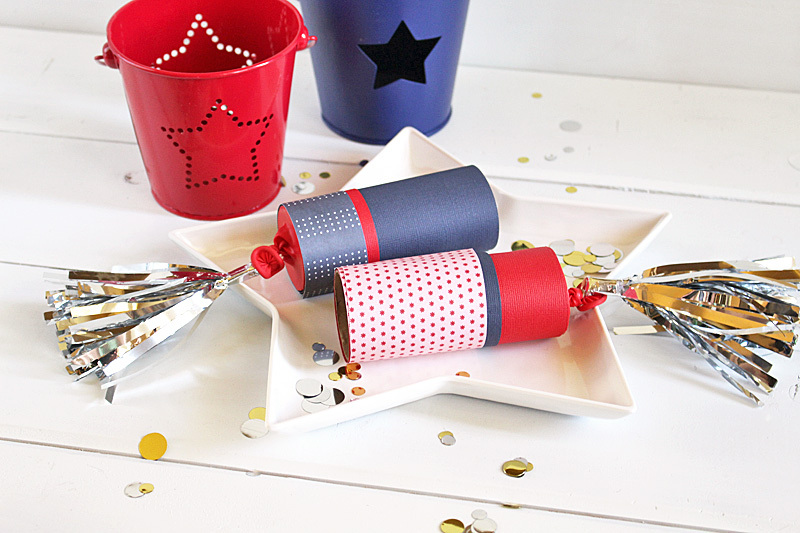 To create these fun poppers, gather card board paper tubes, balloons, card stock, patterned paper, tape, and confetti. Tie the end of the balloon. Cut the top third of the balloon off. Stretch the balloon over the end of the cardboard tube, being careful not to bend the tube. Secure the balloon with tape around the edge. Make sure the balloon is stretched tightly across the top of the tube. 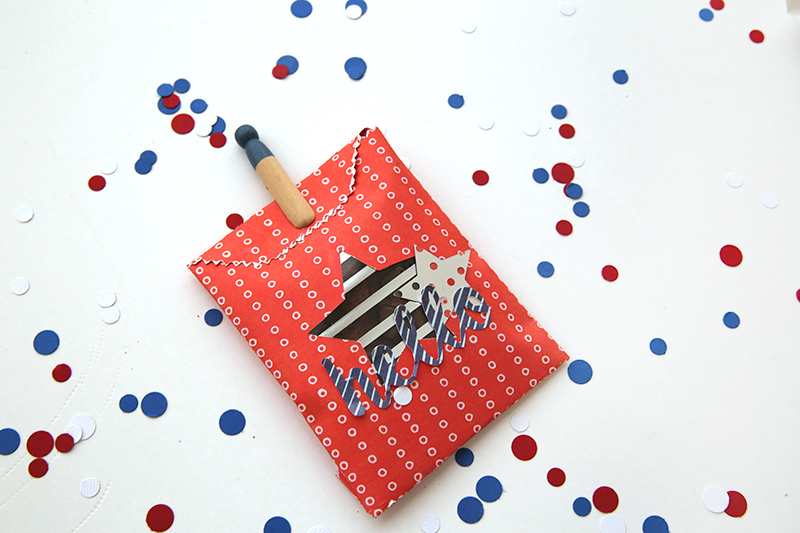 Cover the cardboard tube with card stock and patterned paper. 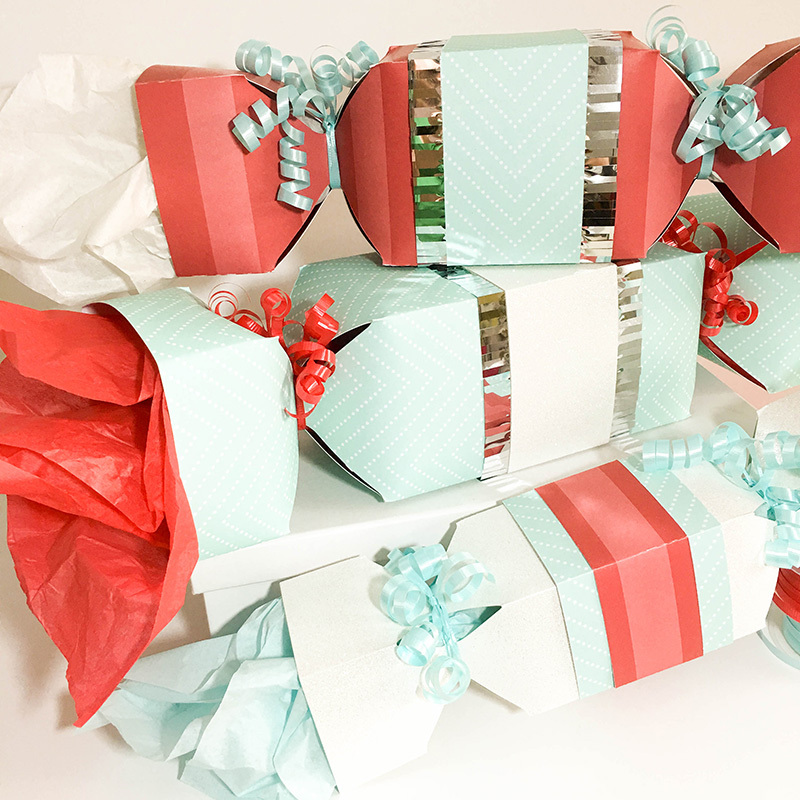 TIP: When wrapping cylindrical objects with paper, make the length wrap around at least one half time more. It helps keep the paper attached. 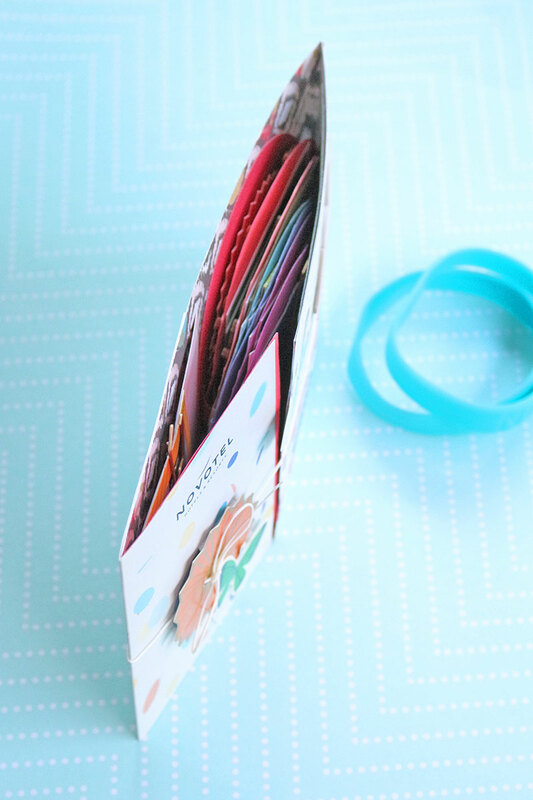 Tie a DIY Party Fringe Tab to the end of the balloon, below the knot you created earlier. Trim the excess string. 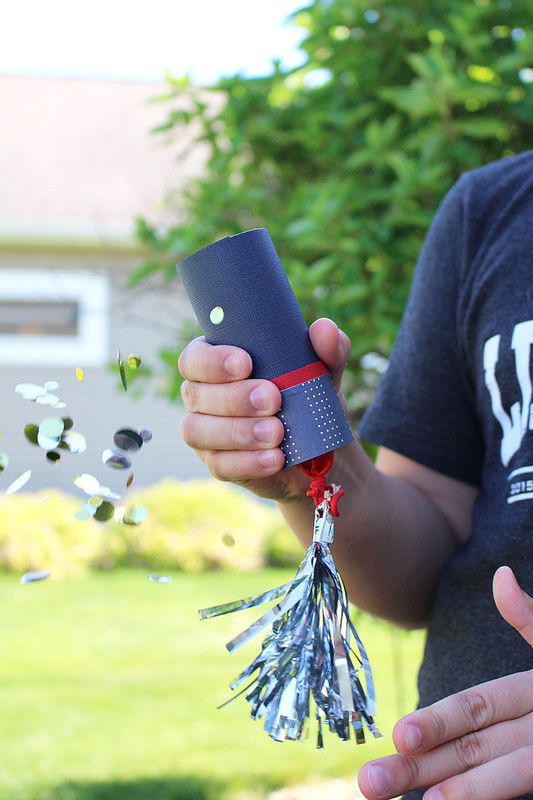 I love how the DIY Fringe Tab makes this confetti popper look like a firework! Now for the confetti! 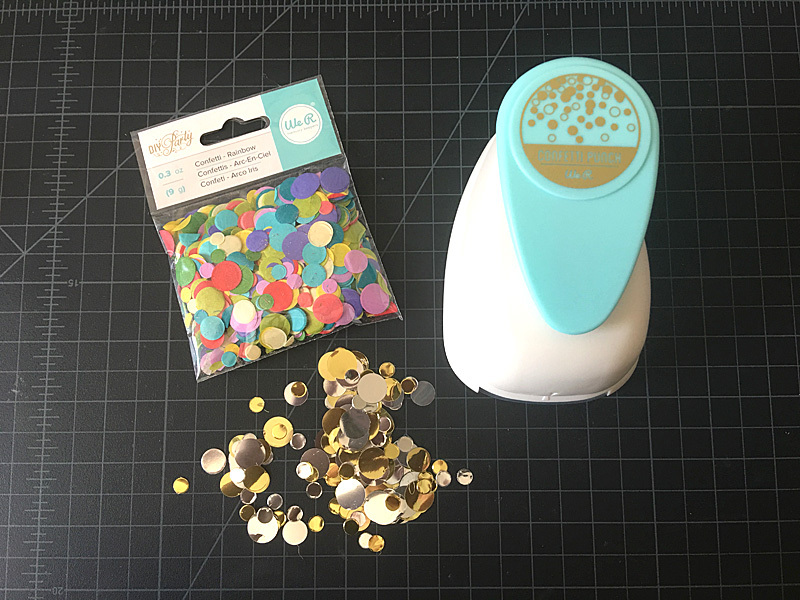 We R Memory Keepers has many choices for confetti, Rainbow and Metallic, or you can even use the DIY Confetti Punch to create your own custom colored confetti! 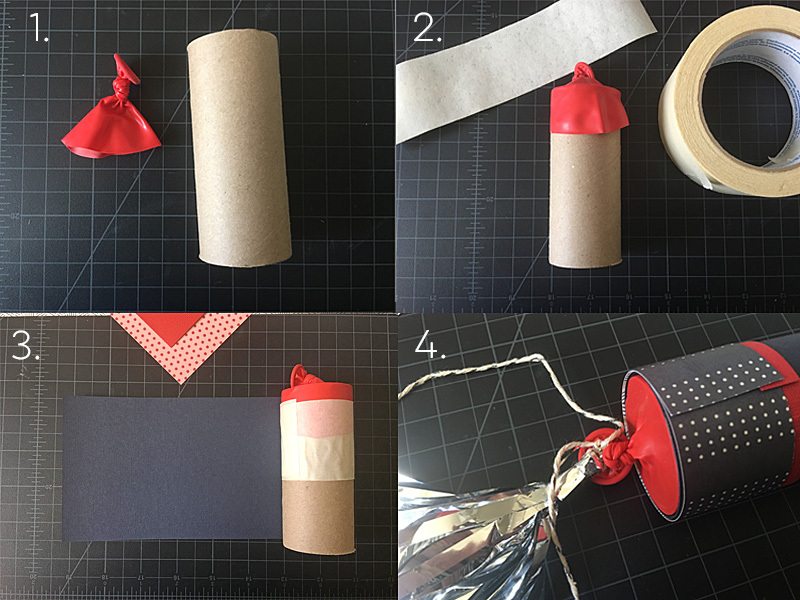 Fill the open end of the tube with confetti and pull down on the balloon end. 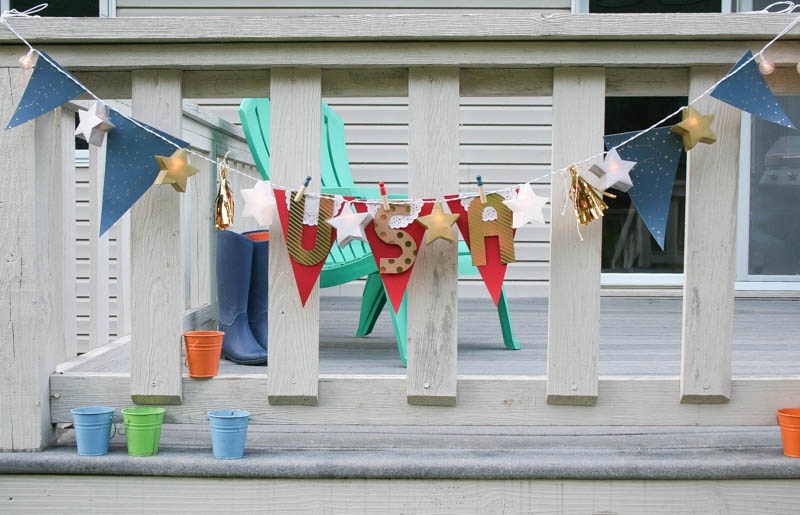 What are you celebrating this summer? Hello We R fans! Chantalle here–thank you for stopping by. 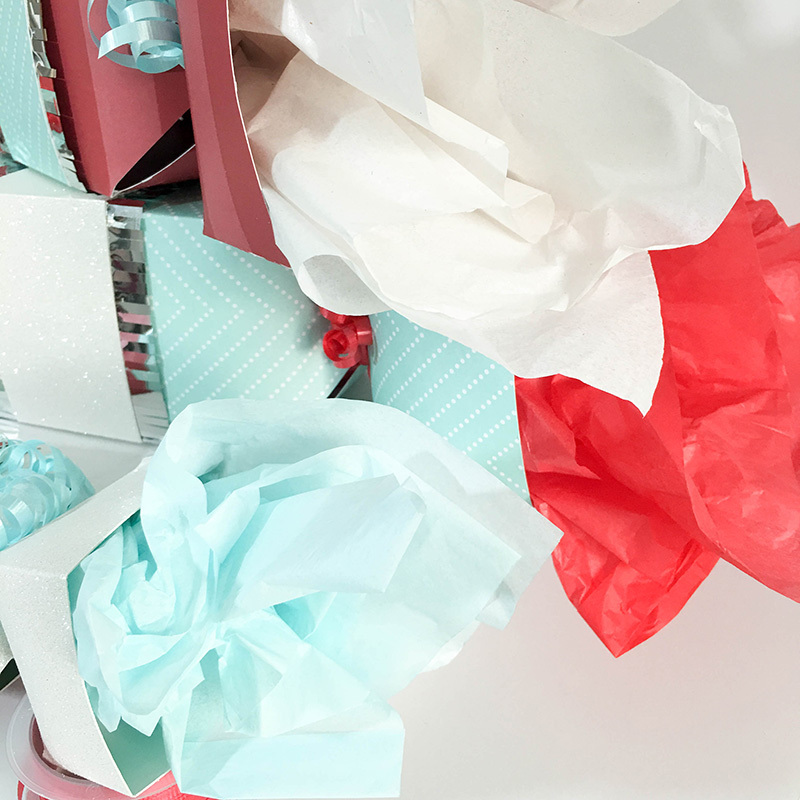 Today I would like to show you a holiday album I created using a bright mix of papers and embellishments, all pulled together (excuse the pun!) with the DIY Party Link Punch. 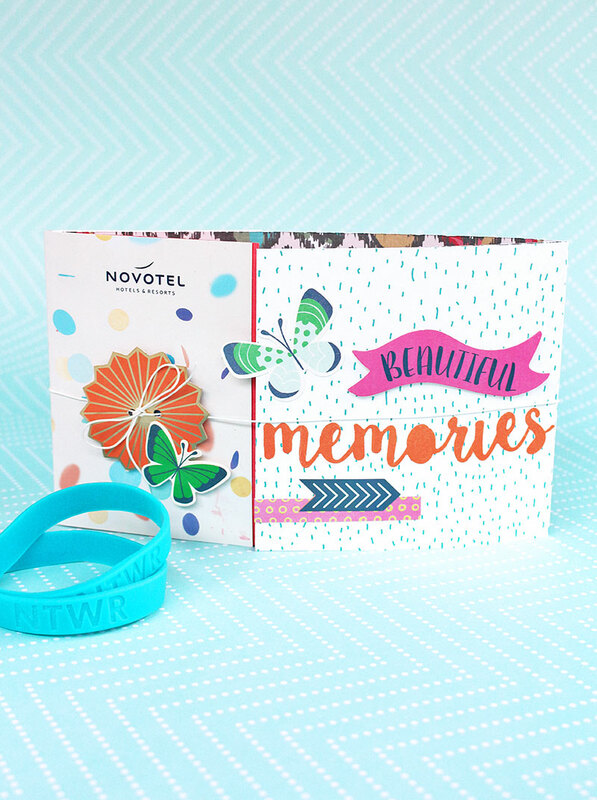 I kept a few mementos from our summer holiday last year which came in handy as a starting point for this project. The little card they supplied our hotel room keys in makes up the one side of this album which opens up to reveal a pull-out photo chain. Cutting a strip of Crush, Young Love to the same height as the card and then a full 12 inches long, I folded in the right hand side to create a gate fold. To keep the album closed, I’ve popped an Oh Goodie Starburst closure onto some foam tape and then run some of the white twine that comes with the closure packaging around the outside of the album and up through the holes in the closure to tie shut. 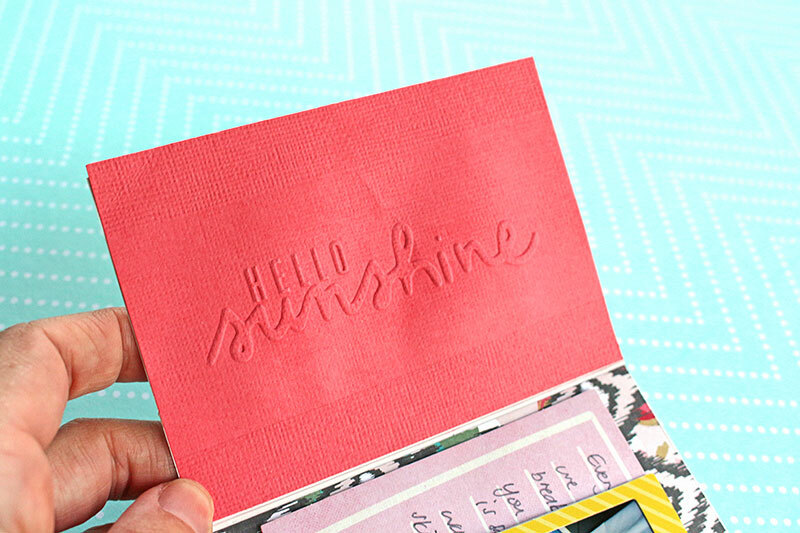 The inside left side has a summer message embossed into some coral cardstock. I still can’t believe how easy the Evolution Advanced is to work with. 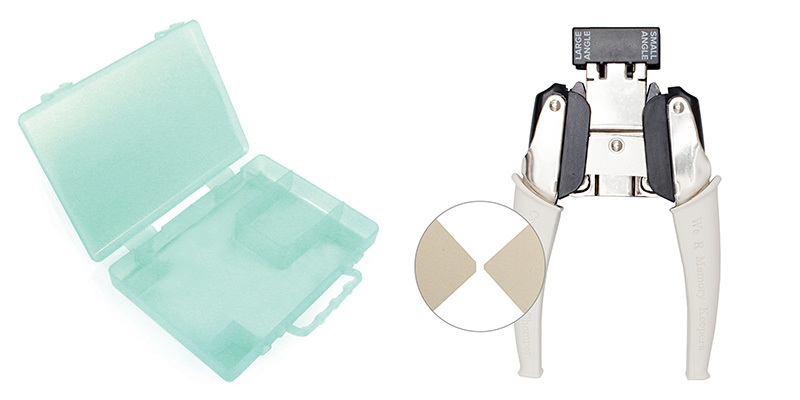 No more straining on a cutting machine handle! 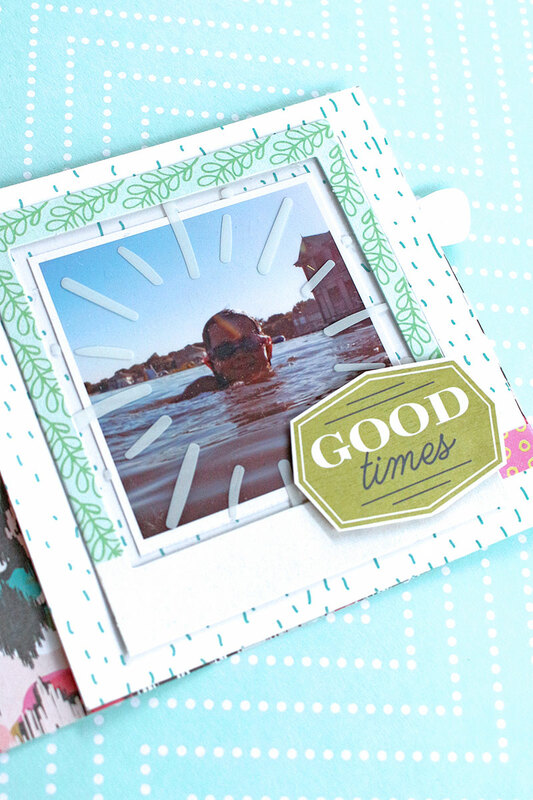 In the centre I’ve used a card from the Flower Girl card & frame kit to add some handwritten journalling. I’ve deliberately added removable photo over the top so I don’t have to see too much of my mediocre handwriting! The linked album pulls up and to the left or right to reveal series of shots from our time away. 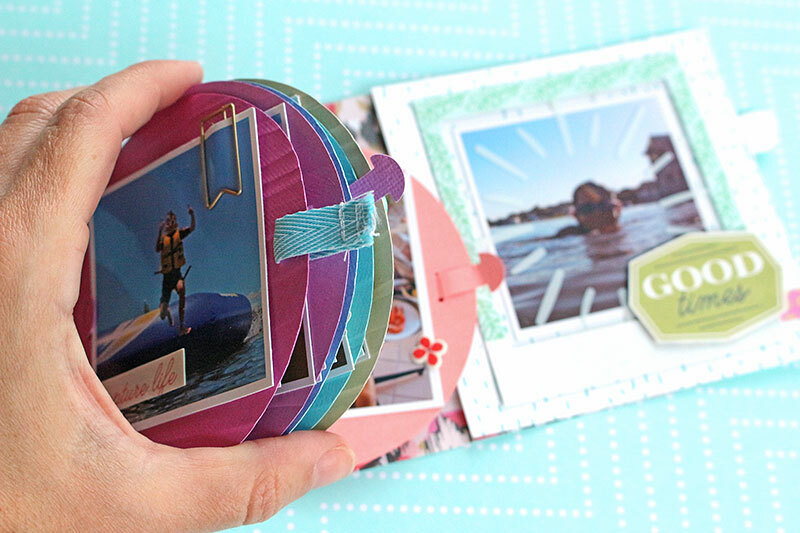 I created this pull out by first cutting 8 circles on various shades of cardstock using my Silhouette Cameo. 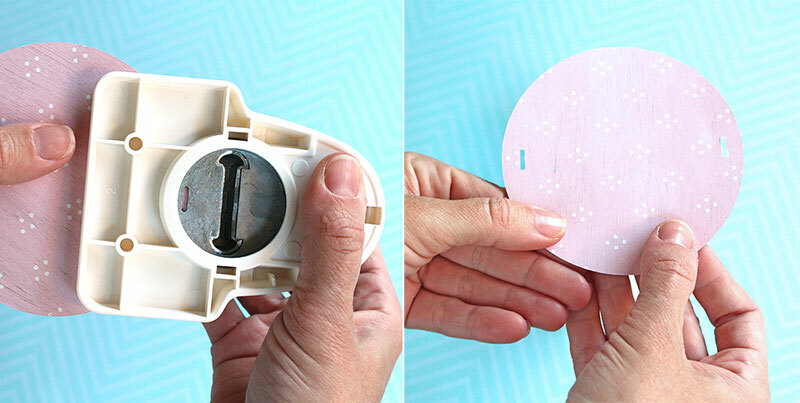 I then used the DIY Party Link Punch to punch through some narrow holes/openings in the circles. I’ve done one on each side of the circle so they will look even when pulled open. 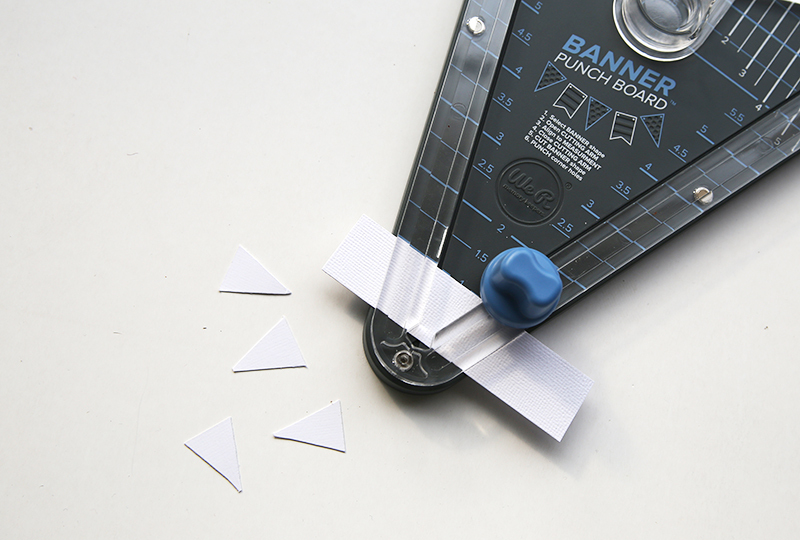 TIP: Be sure to align the edge of your paper only near the small opening part of the punch. If you push the paper in too far it gets a little nip from the link part. 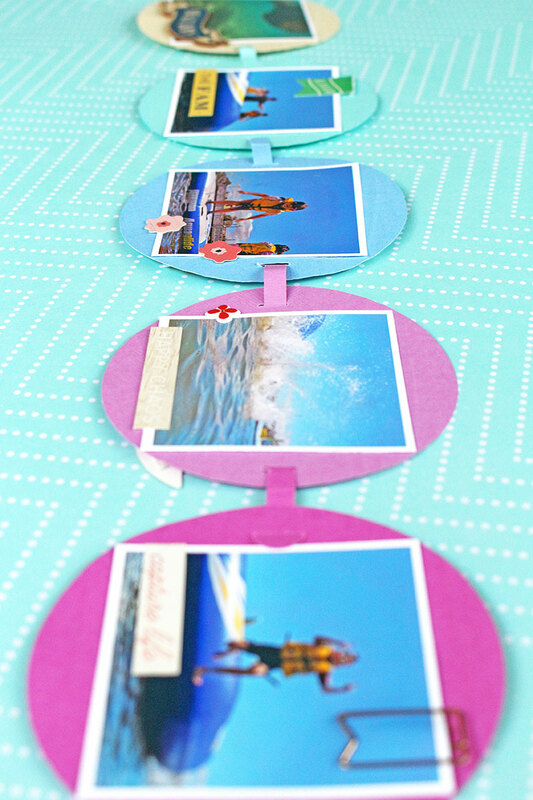 Once you have punched the holes in your circles, you can then create the links in matching paper. 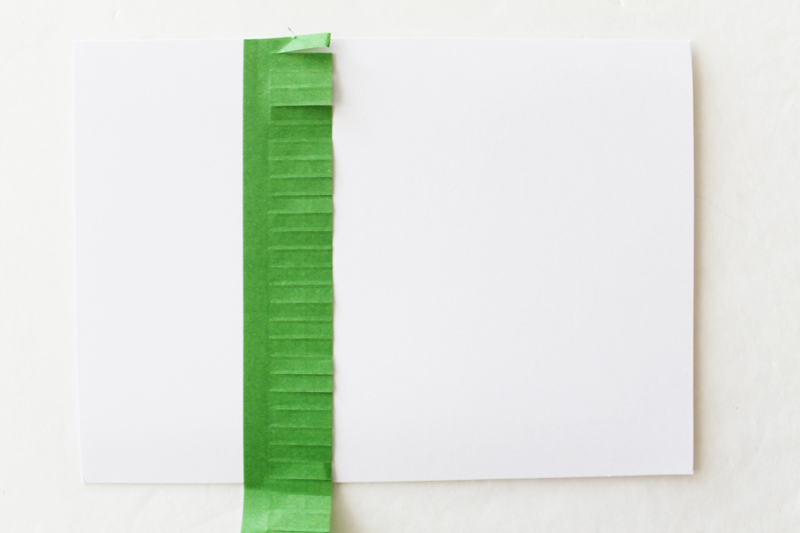 Tip: Use a sturdy paper for the links so they stand the test of time. Next, I folded up my circles and adhered the last one to the base of the album. The photo lifts up to recall some info about our stay. I arranged my circles in a spectrum. All the colours of happiness! This is what the opposite side of the circles look like. I’ve given them a textured effect with an Evolution advanced embossing folder. It could sort of pass as water so I thought it would work. It also looks better than just plain cardstock. The last tile on the inside was this photo of Erin waiting for me in the water. I’ve used one of the pre-cut acrylic squares in the Flower Girl Card & Frame kit and used it to draw attention to the centre of the image. A view from the top… chock-full of beautiful holiday memories. Hello friends! It’s Aly Dosdall here today. 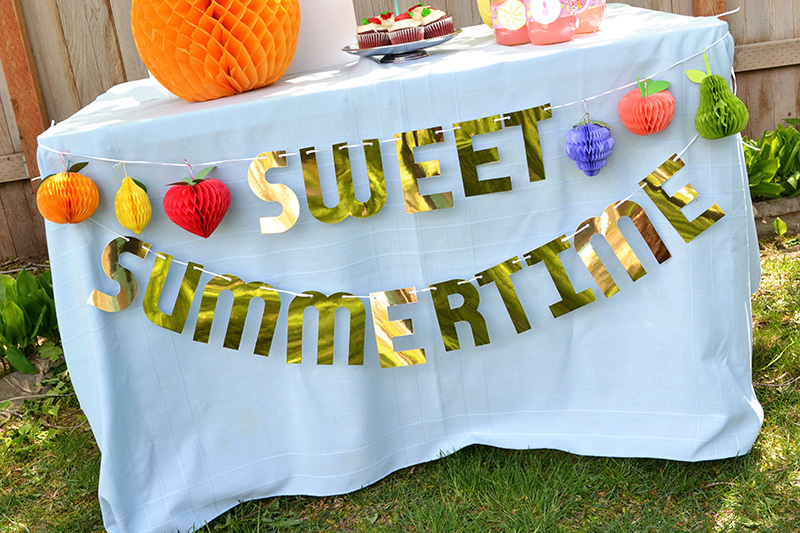 Looking for decor ideas for a summer party? 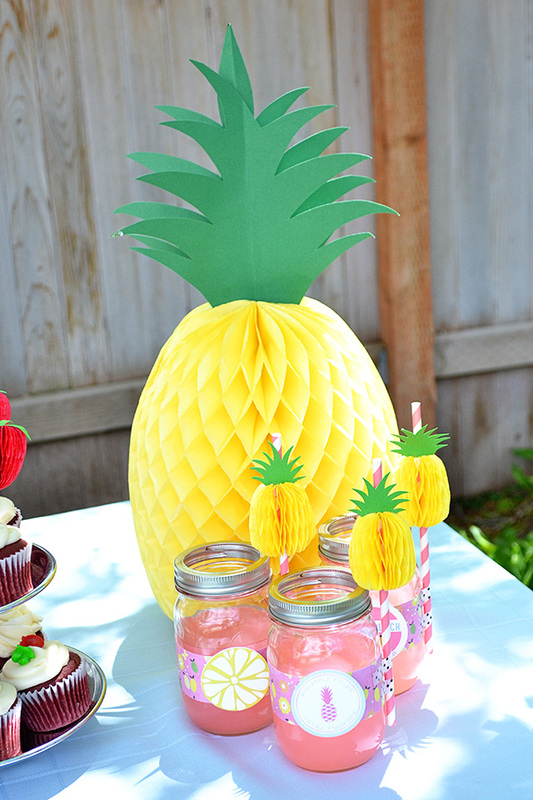 Or, maybe you’re hosting a luau soon? 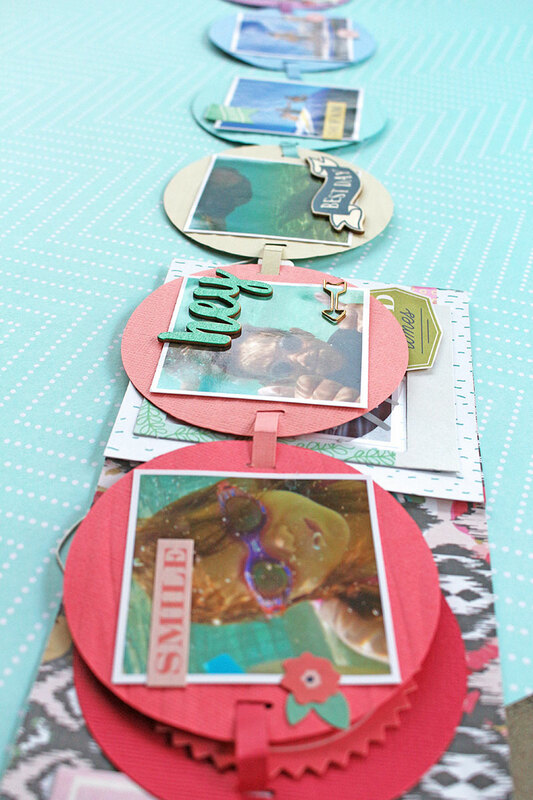 Look no further than the DIY Party collection! 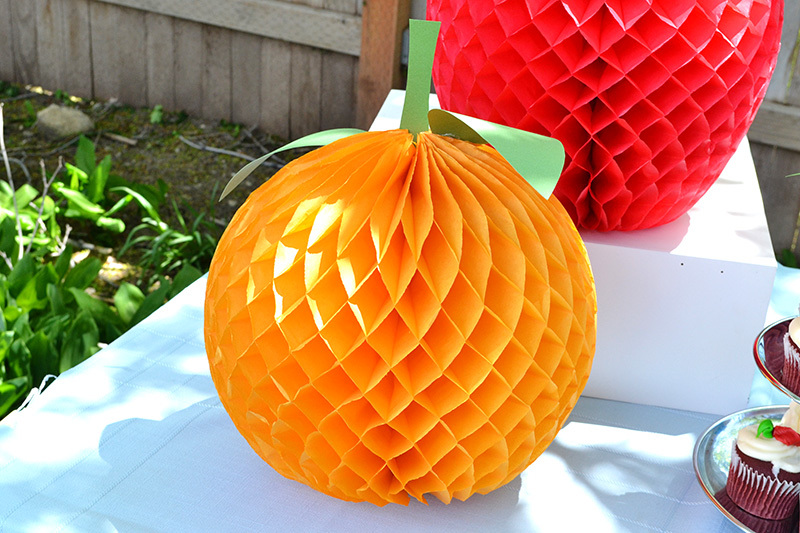 Honeycomb Paper shapes are a colorful and festive way to decorate for any summer get-together. 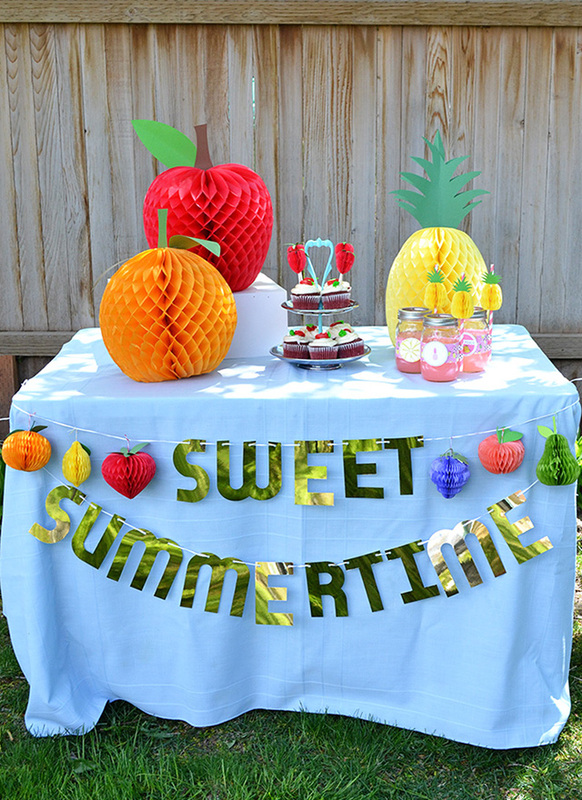 Here are a few ideas for customizing those honeycomb decorations for some summer fun. 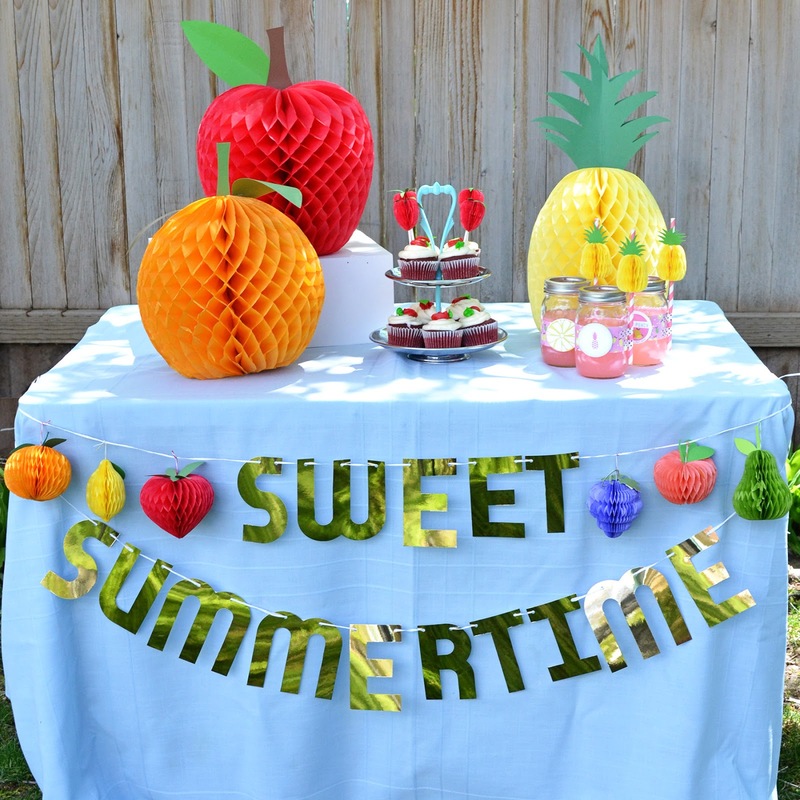 For easy fruit decorations for hanging or for use as centerpieces, grab an orange, red, or yellow Honeycomb Pad, cut fruit shapes using the Honeycomb Stencils, and add some green paper leaves. For a centerpiece, trim the bottom of the honeycomb fruit shapes so they’re flat before fanning them out so they will sit well on the table. 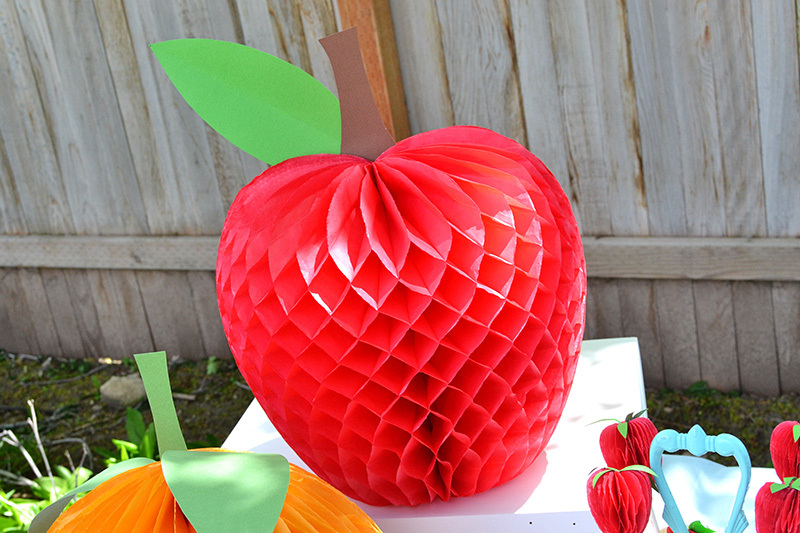 You can also draw your own shapes on the honeycomb pads to create different types of fruit decor. 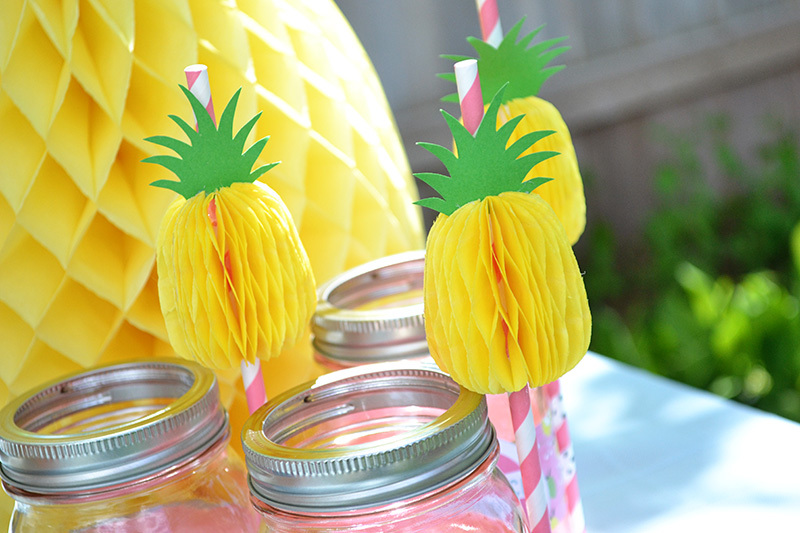 Tip: When adding honeycomb shapes to straws (or other thick items), try cutting off the glued edge of the pad first so it will fit around, then add some glue to secure it to the straw. 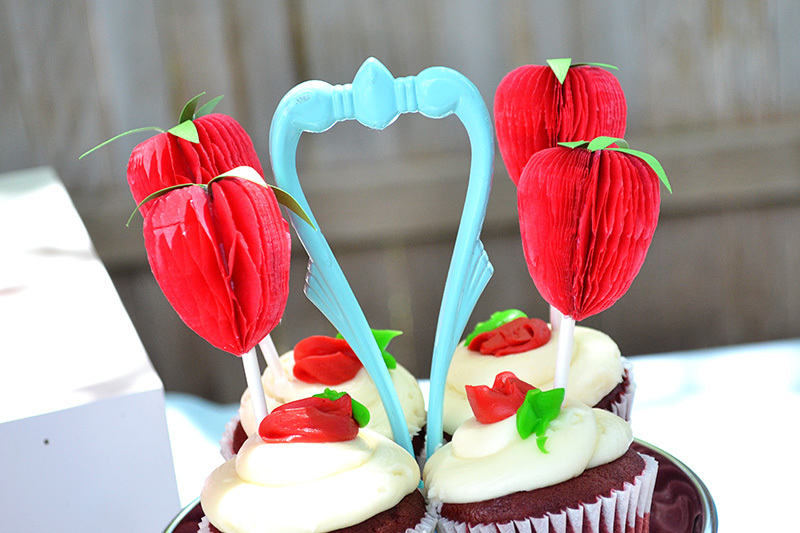 Lollipop sticks topped with honeycomb shapes make for darling cupcake toppers. 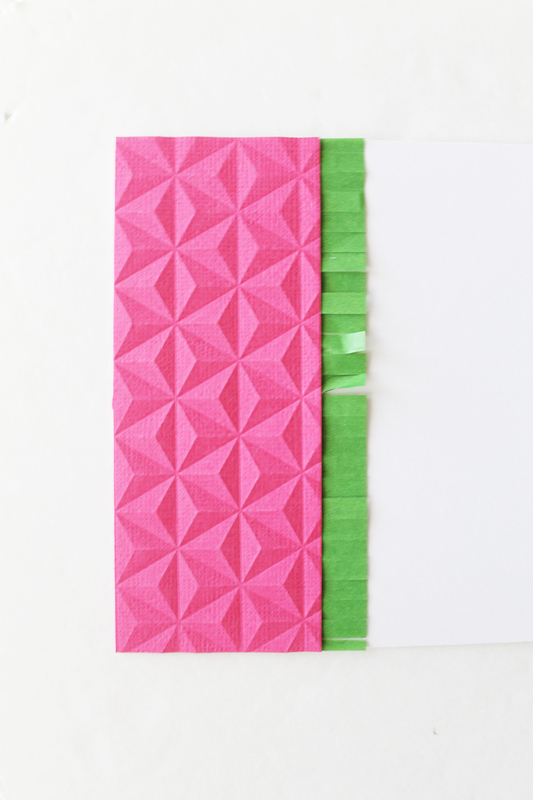 With sticks this thin there’s no need to cut off the glued edge of the honeycomb paper. I cut some freehand fruit from the Honeycomb Pads for the banner, and I used one of my favorite crafting tools, the Alphabet Punch Board, to punch the letters from Bazzill Gold Foil Cardstock. Love how it turned out! Honeycomb paper is so much fun to create and decorate with. 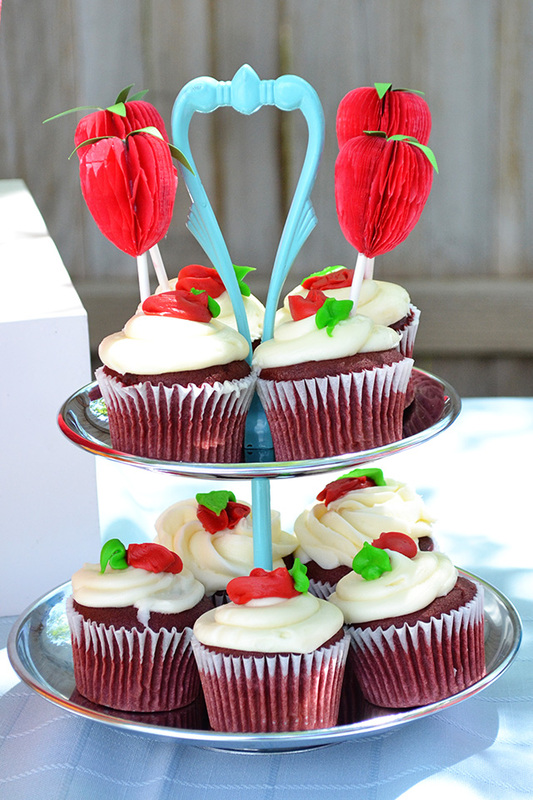 I love the texture, dimension, and color it adds to party decor. 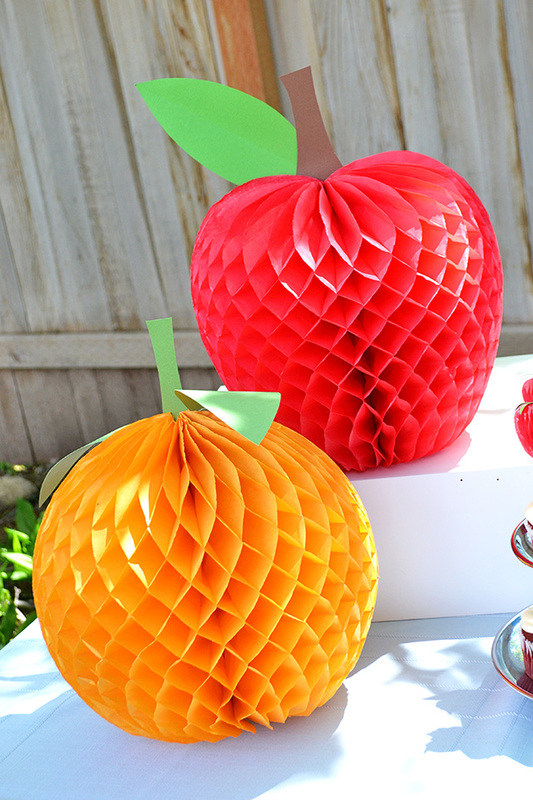 Recently I shared these ideas, plus more honeycomb paper party decor ideas, on a local Utah lifestyle show, Studio 5. You can watch my spot on their website HERE. Enjoy! 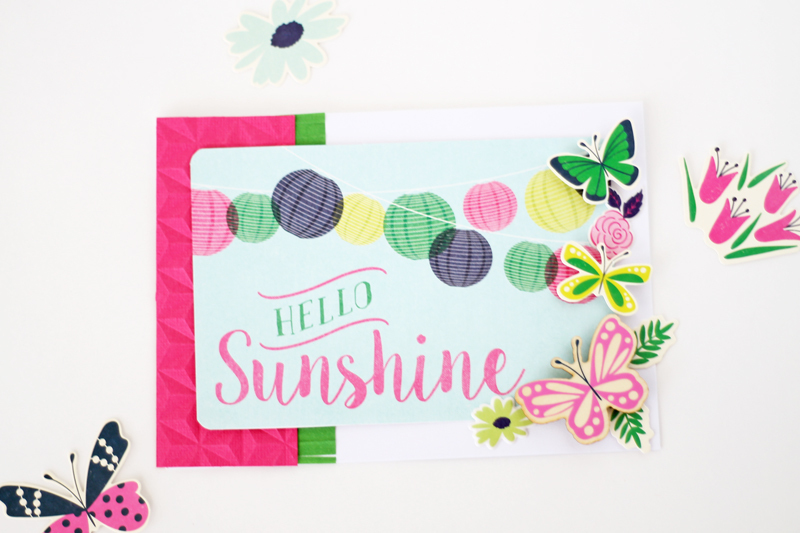 Hello, Laura here today to show you how to create a fun and festive summer card. 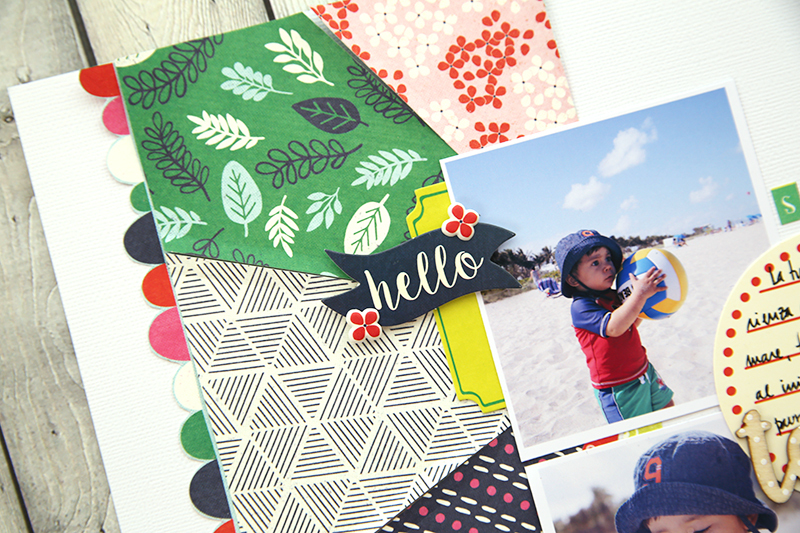 The new Flower Girl collection is perfect for creating summer projects with. I started with a 5 x 7 folded white card stock card. I added a layer of Meadow fringe tape about a third of the way from the left side of the card. I am really loving the fringe tape. 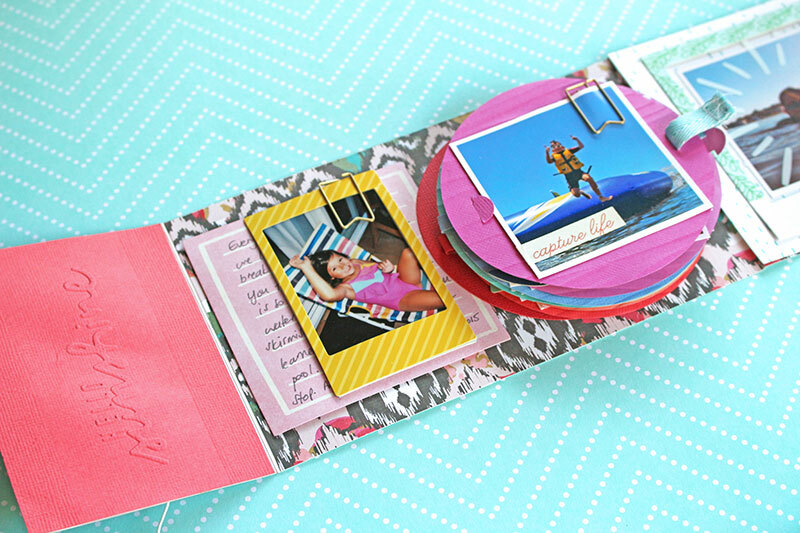 It is so easy to use and adds a fun element to your paper crafting projects. 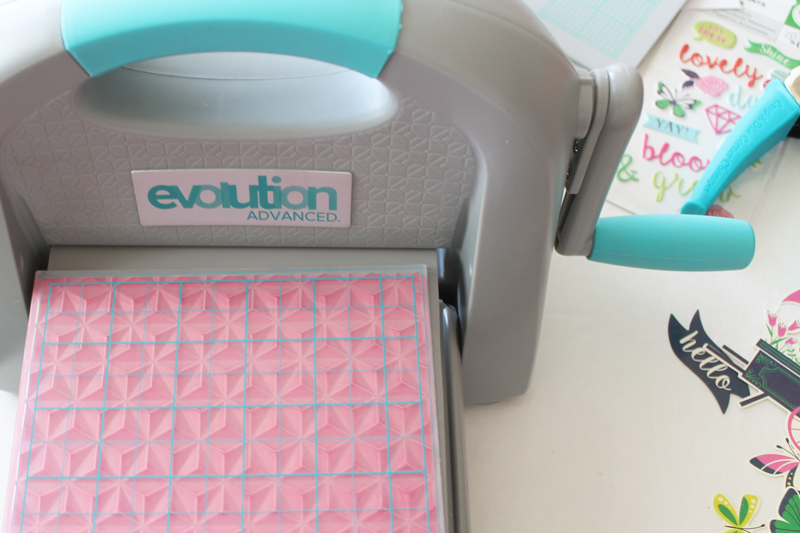 I used a dark pink textured cardstock and ran it through the Evolution Advanced using the Geometric embossing folder. I trimmed the embossed paper and added it to the left side of the card with adhesive. I used one of the papers with sayings on it from the Flower Girl collection. 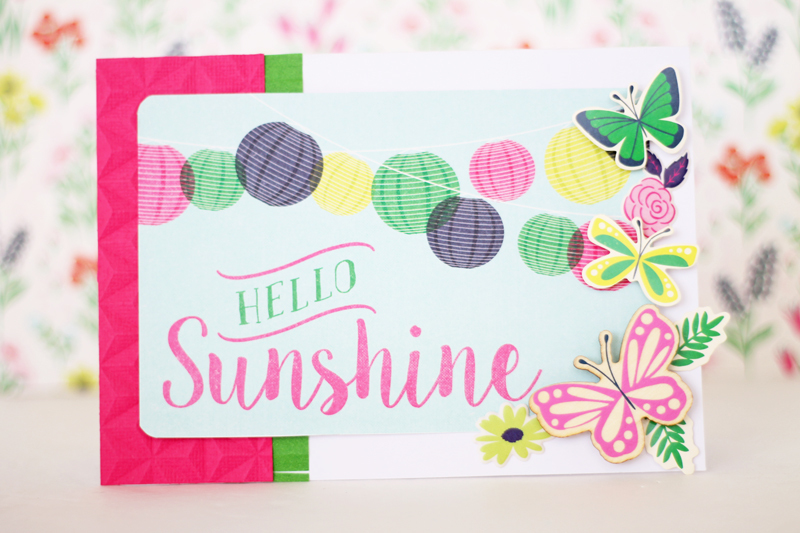 It says “hello Sunshine” with a fun paper lantern banner on it. 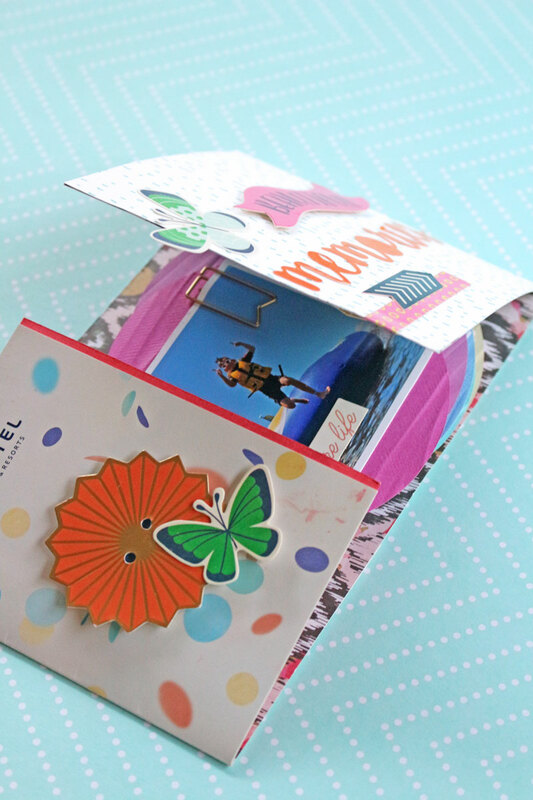 I used the corner chomper to round off the edges and then attached it the card using adhesive. I used elements from the Flower Girl ephemera, veneer shapes and puffy stickers to add some dimension and fun to the bottom right of the card. Butterflies are my favorite and always make me think of summer. 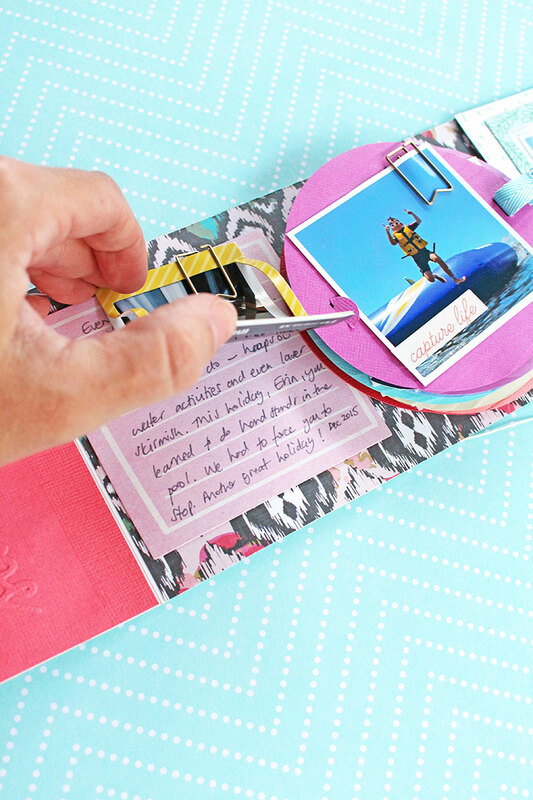 I love using papers and embellishments from one collection to easily create projects. I know everything will go together so it takes a lot of the guesswork out of it for me.